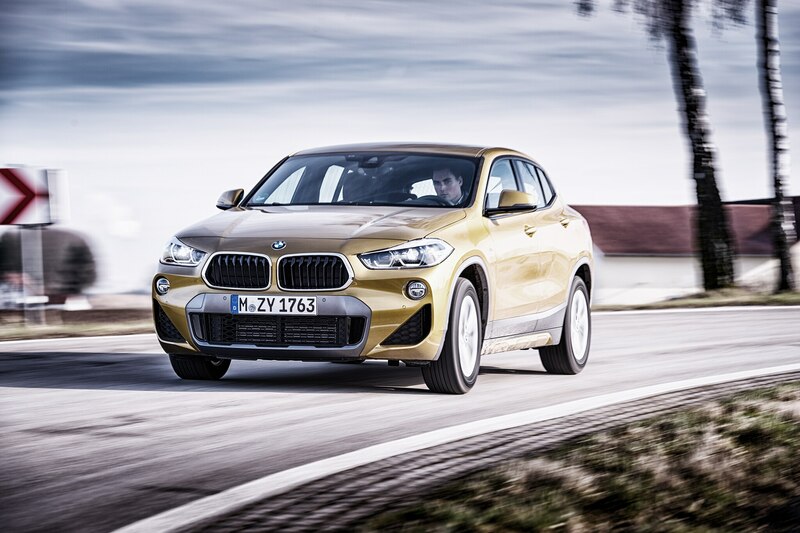 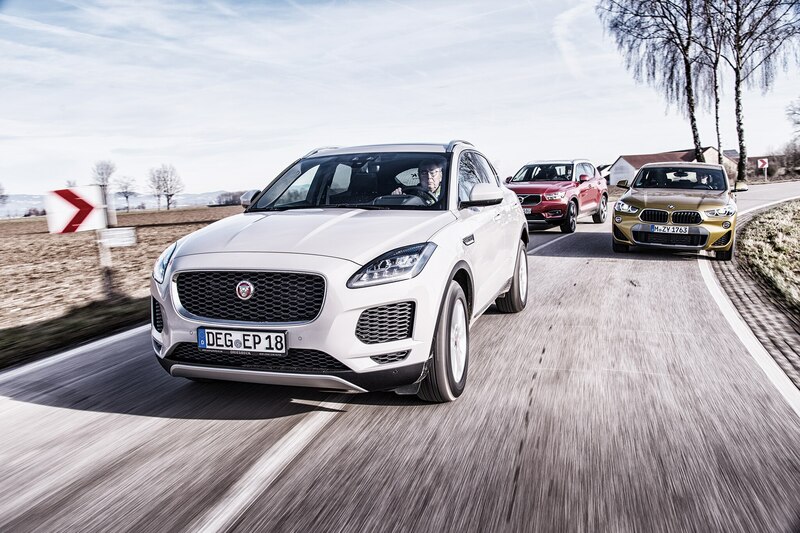 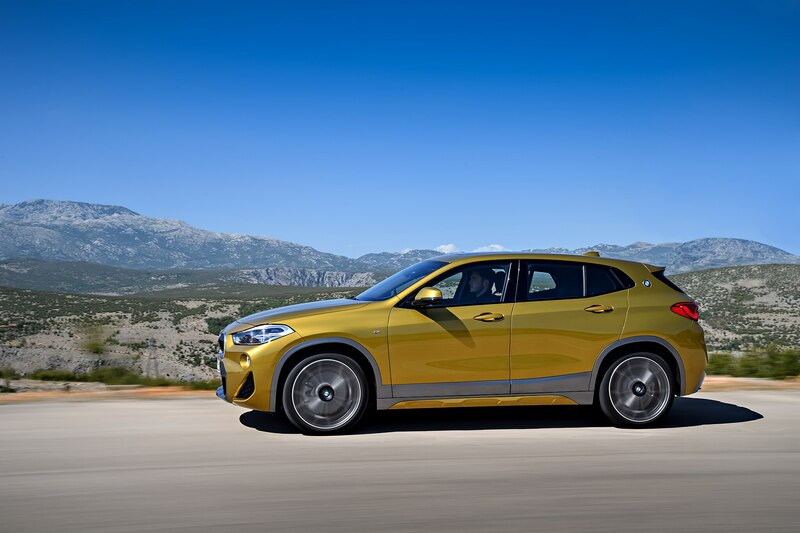 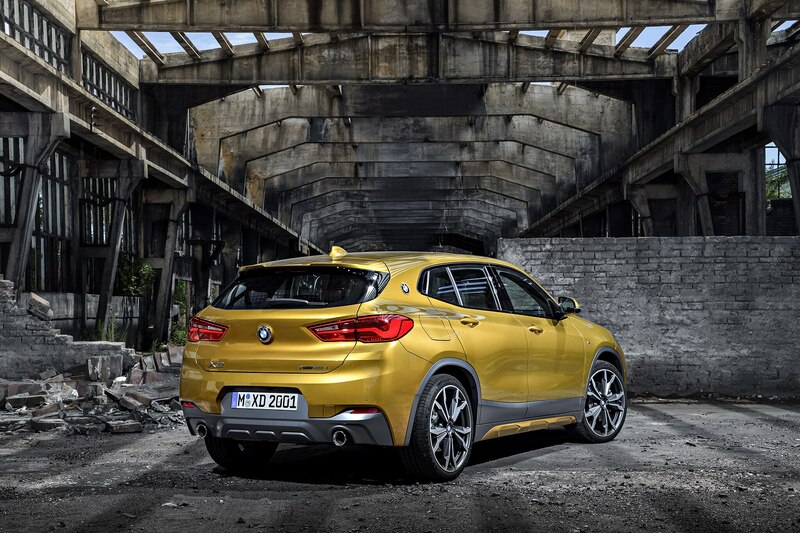 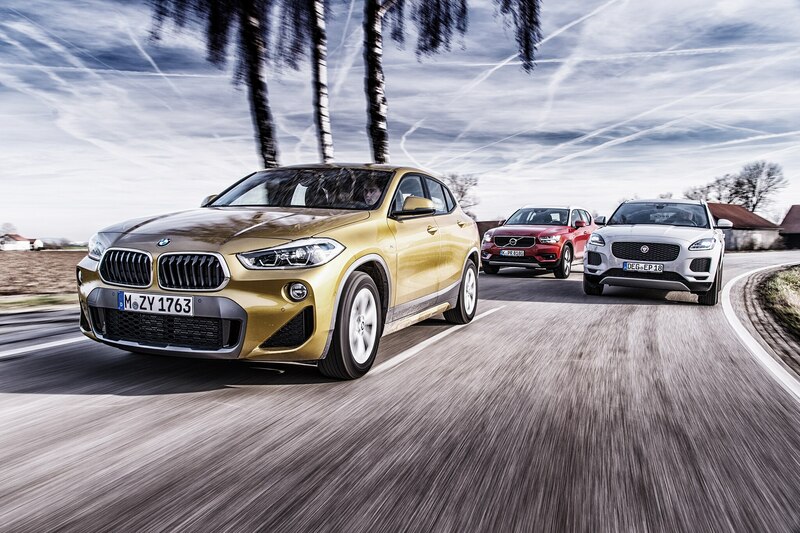 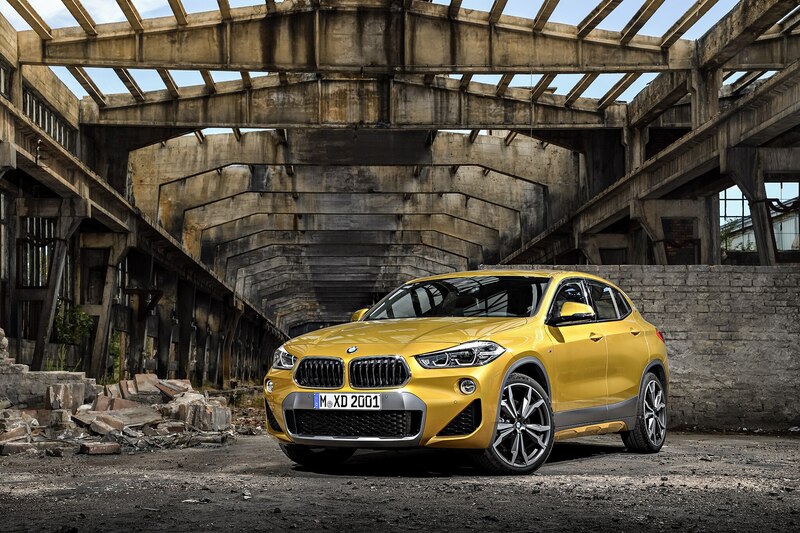 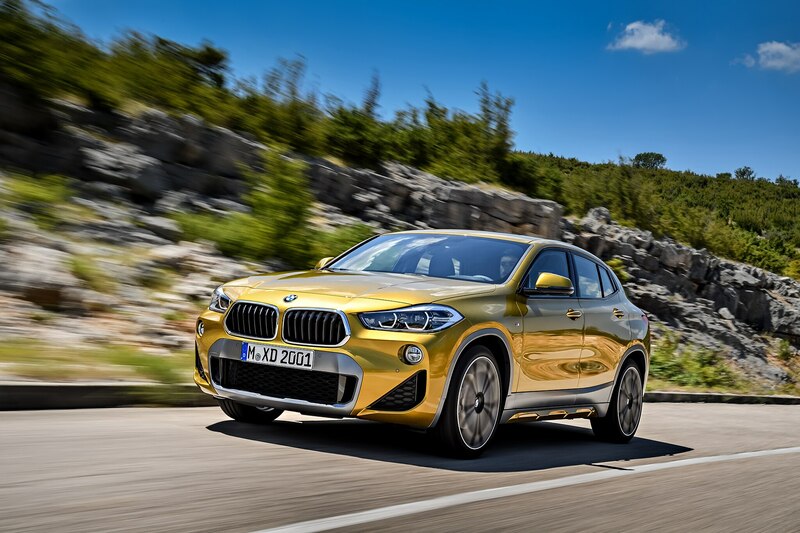 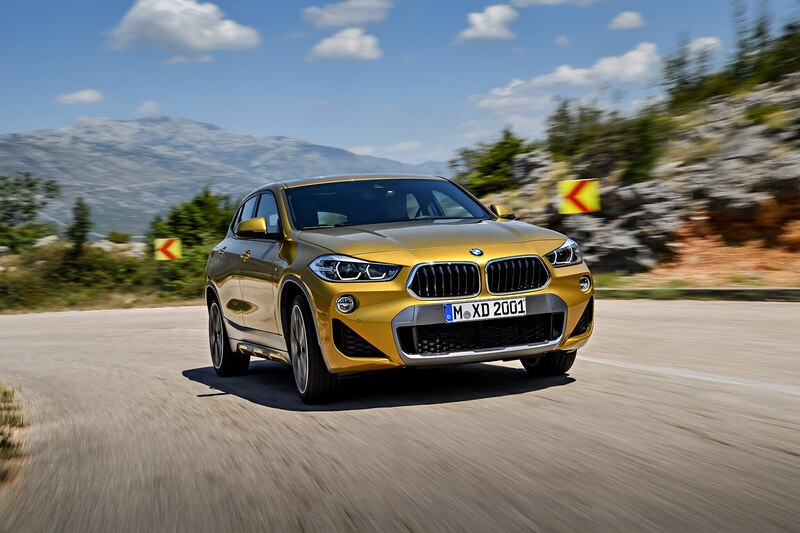 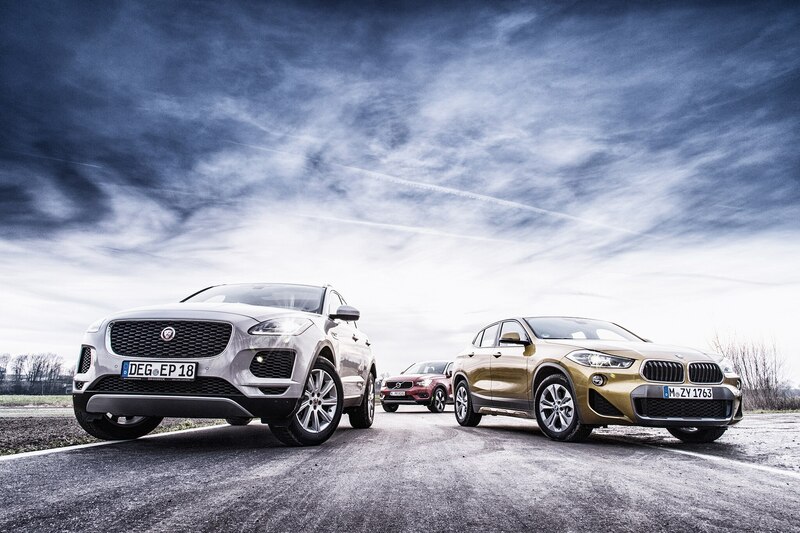 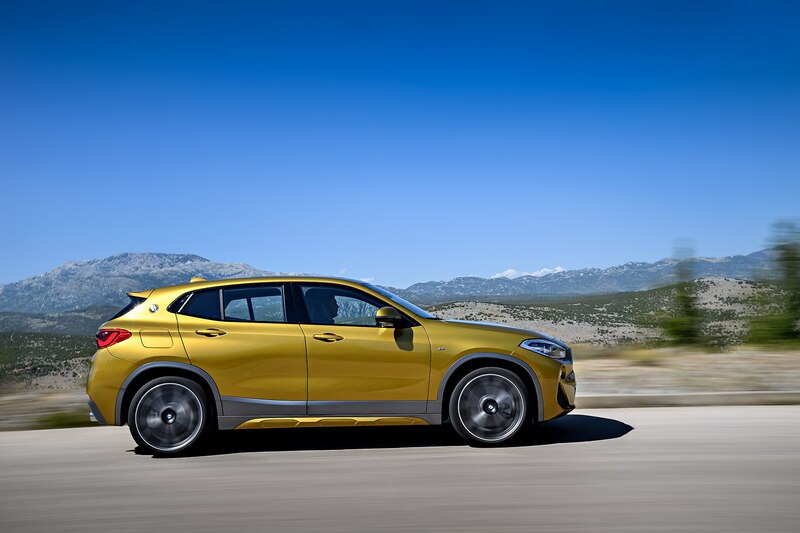 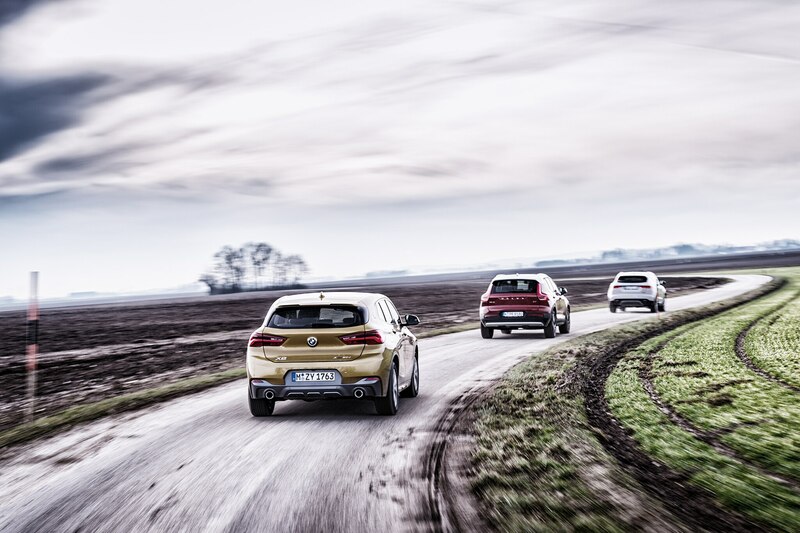 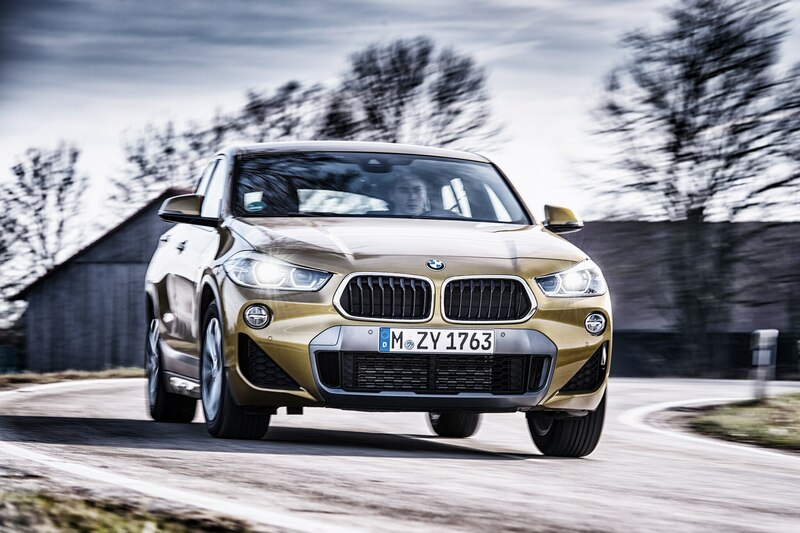 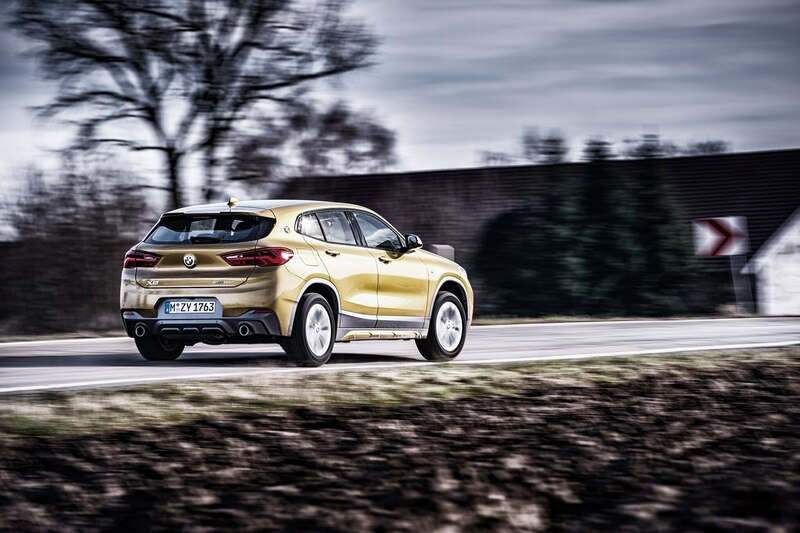 DEGGENDORF, GERMANY—Join us as Munich’s latest compact crossover, the BMW X2, takes on two other similar, all-new offerings by way of Sweden and Great Britain—the Volvo XC40 and Jaguar E-Pace—in a good old fashioned, pan-European shootout. 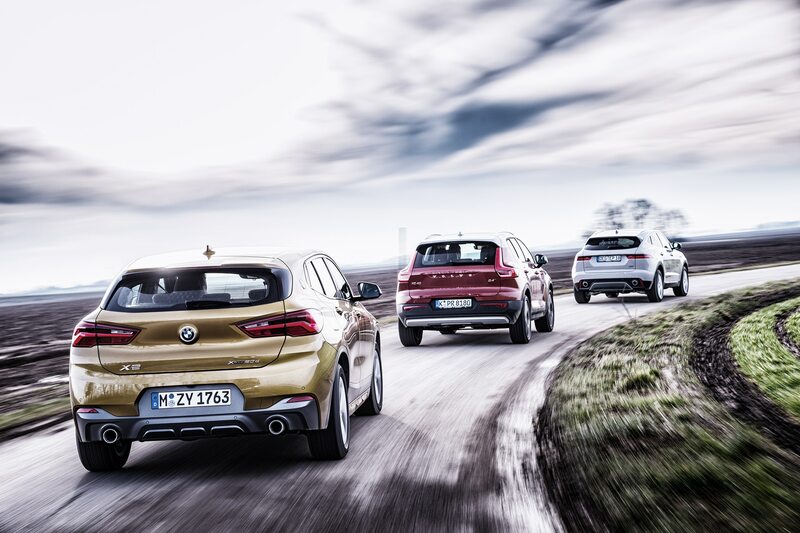 For the three newcomers, it’s about projecting emotional values: image, prestige, desire, and street cred. 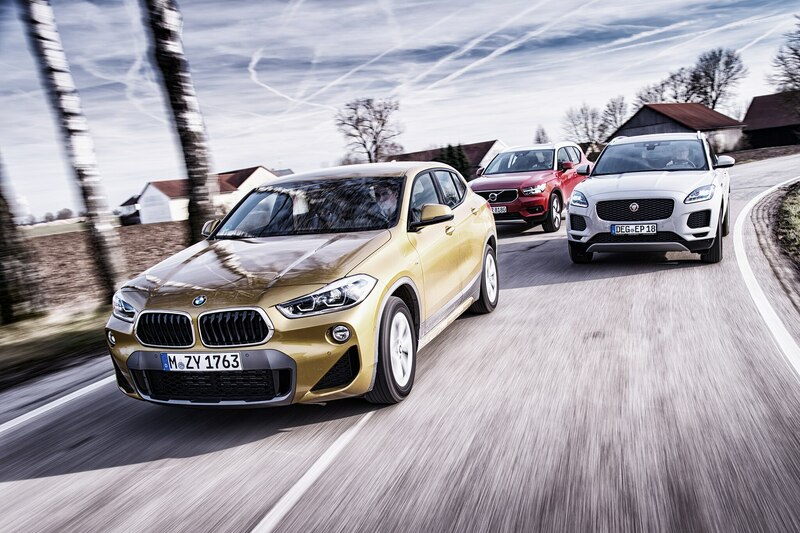 Because while they all have their own unique attributes, in the end it’s more about how well they represent each of their respective marques in the segment. 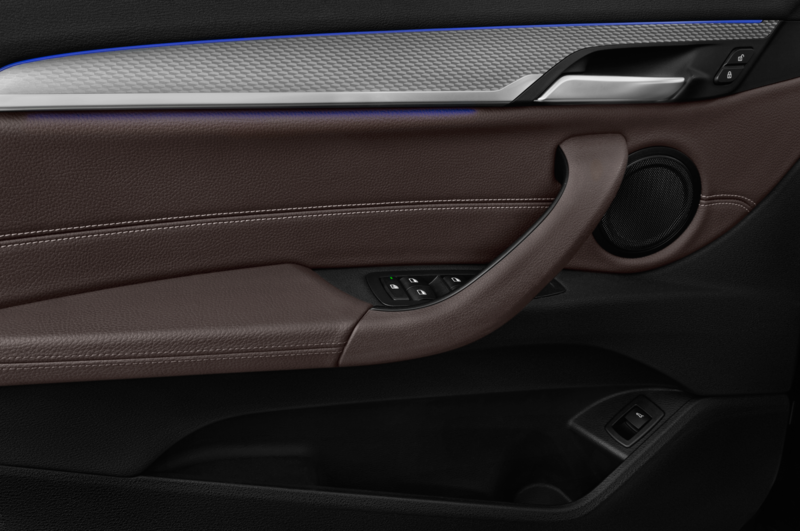 They all certainly represent well in the design department. 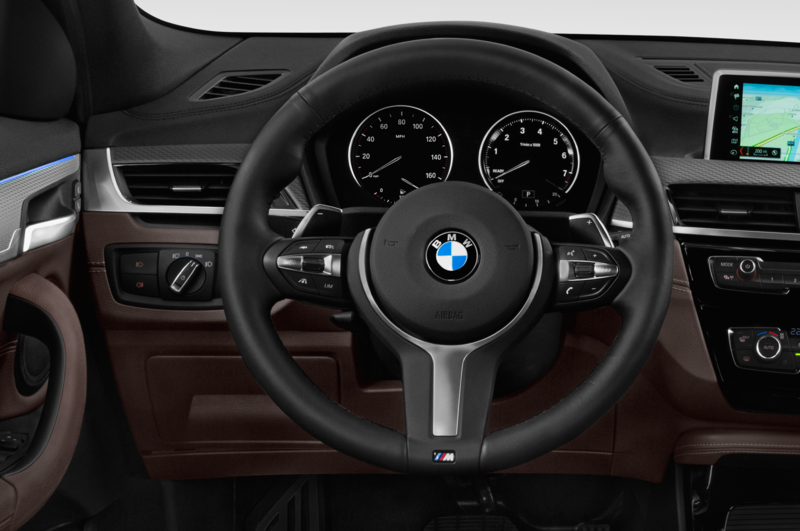 Their shapes blend seamlessly with their corresponding brand’s identity, their cockpits are stylish and well equipped, their cabins cosseting yet functional. 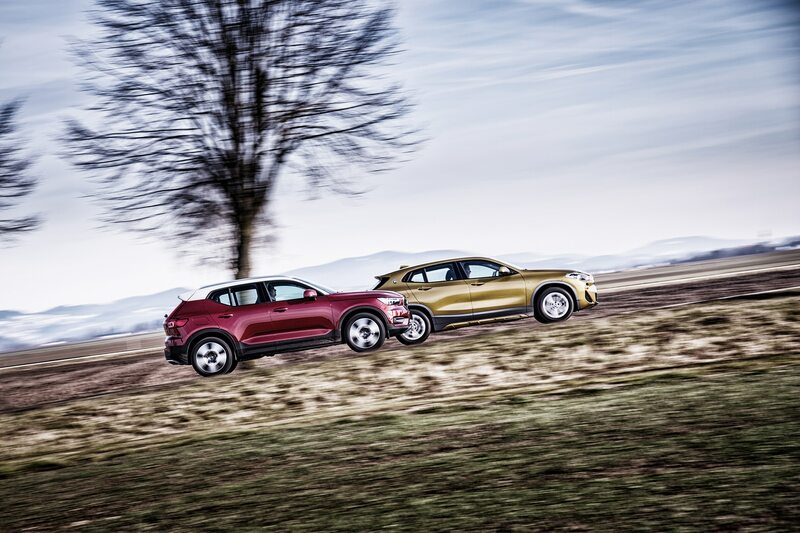 The Volvo’s solid looks are punctuated by some funky details, the E-Pace is the upscale city-slicker of the bunch, and the X2 is a stylish urban guerilla with panache. 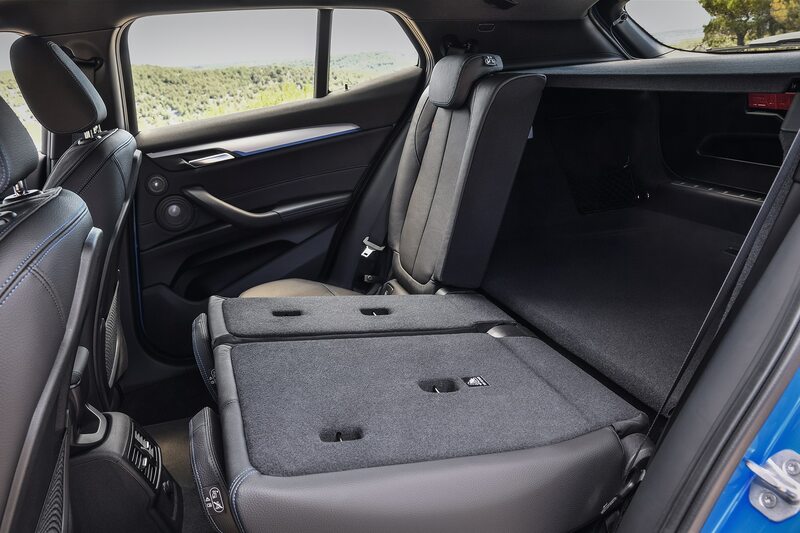 Each is, of course, available with a wide array of standard and available features, and are flawless in terms of active and passive safety. 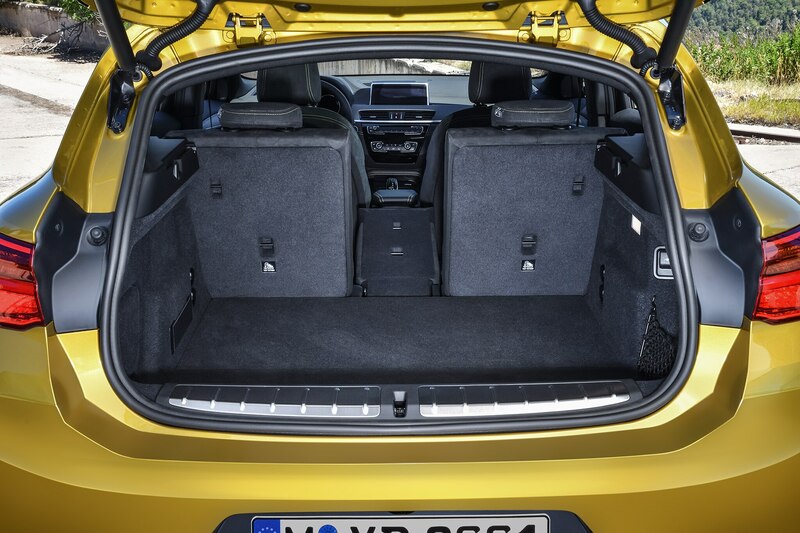 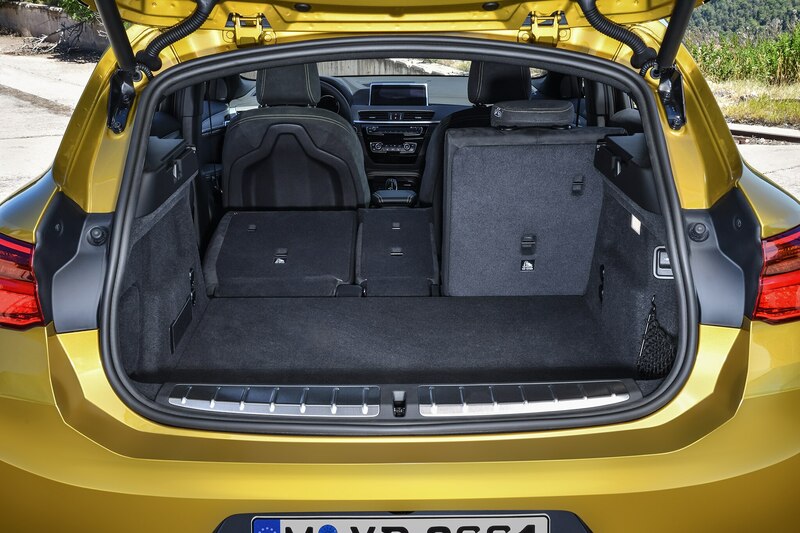 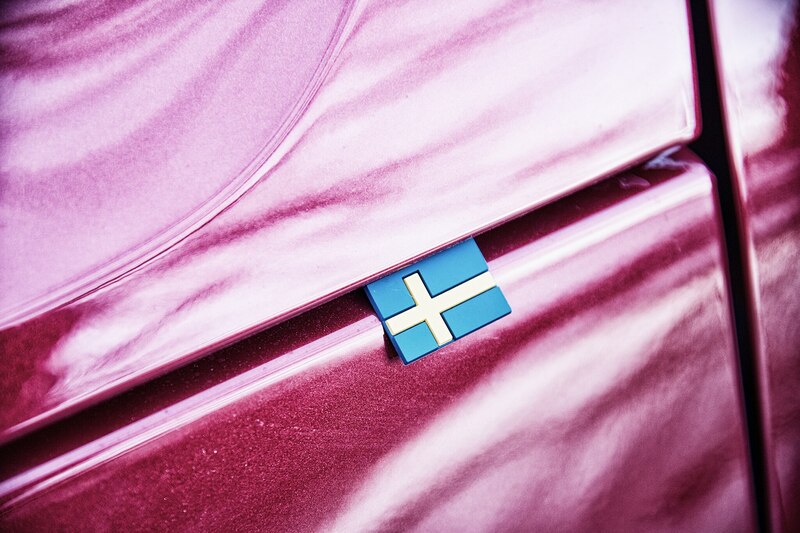 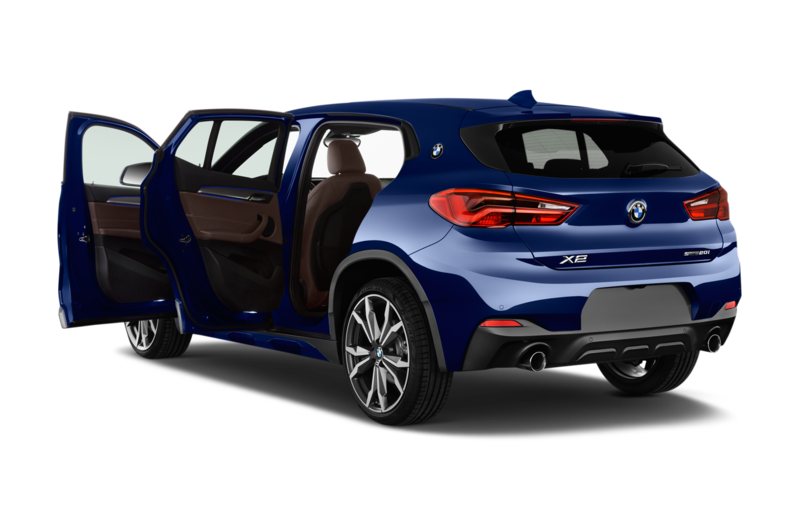 This being Europe, our test trio all came equipped with 2.0-liter diesel engines, but their overall packages were similar to U.S. trim levels. 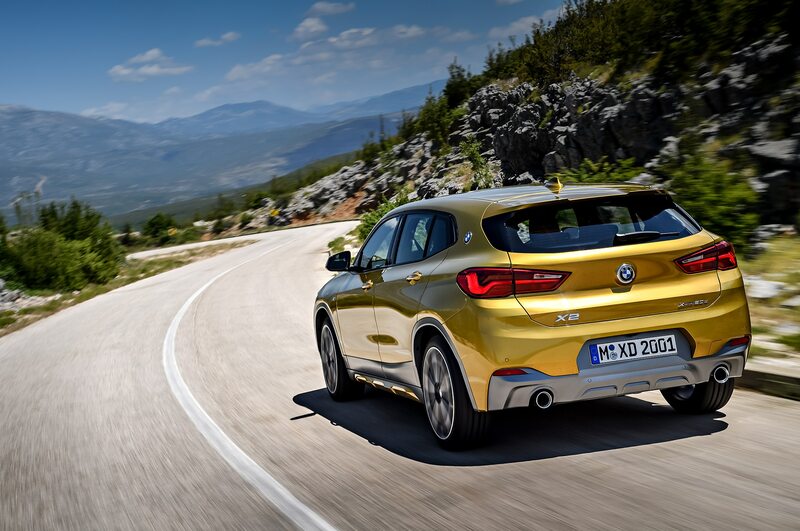 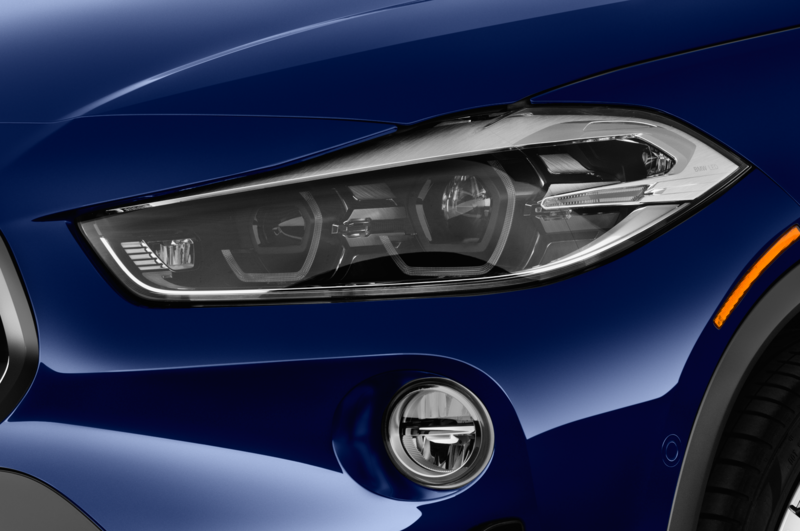 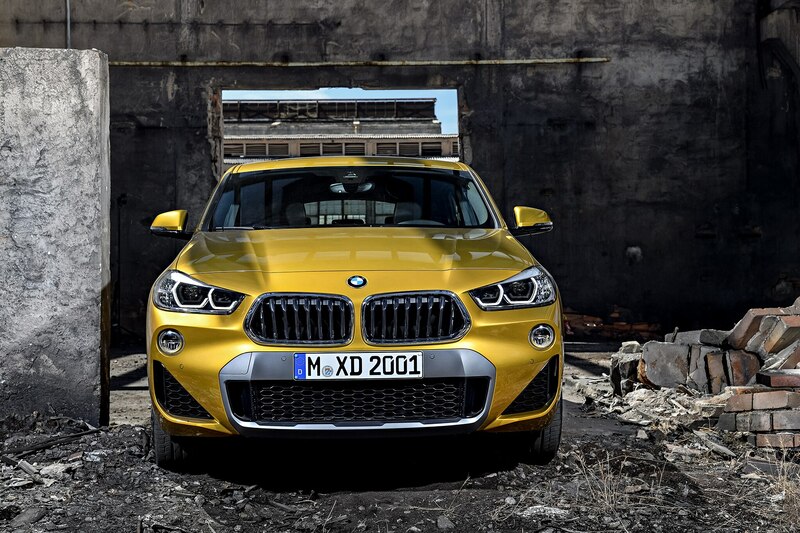 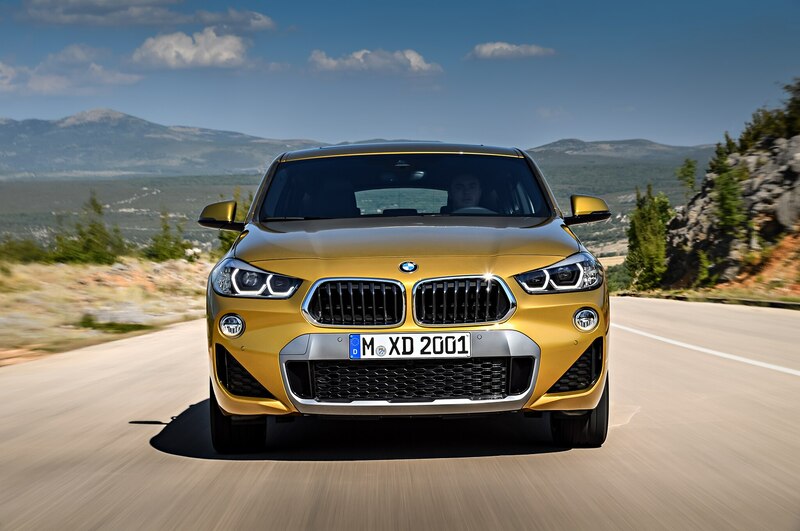 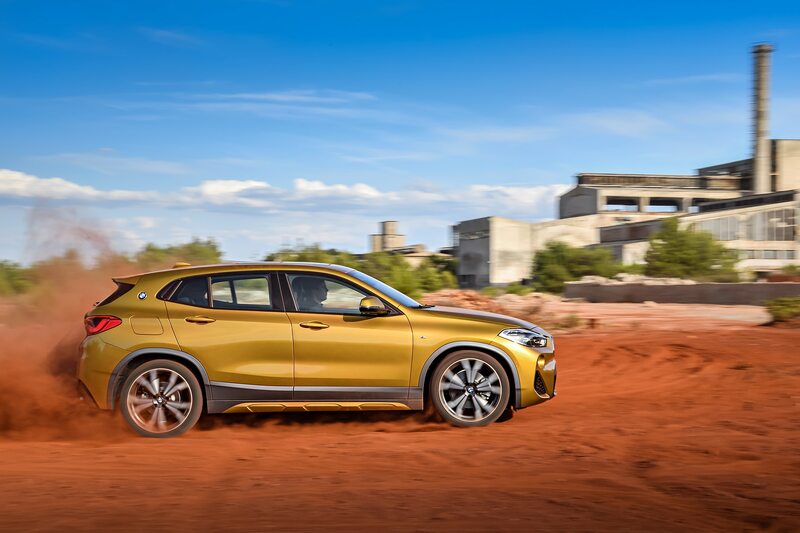 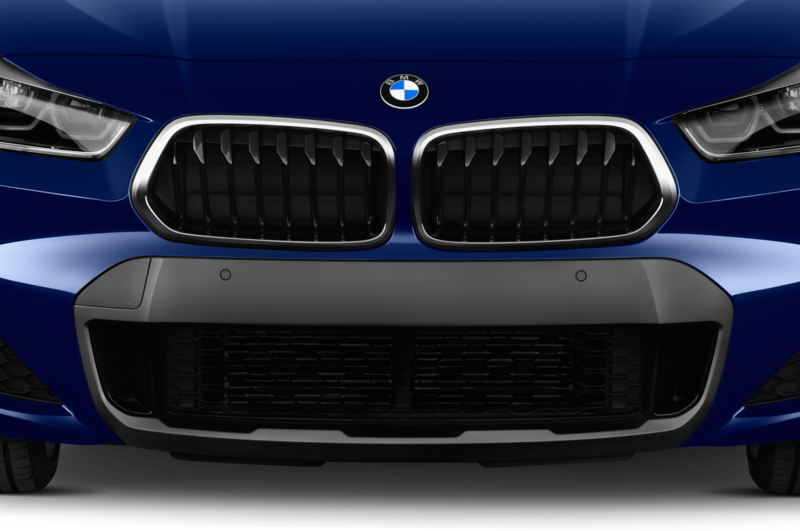 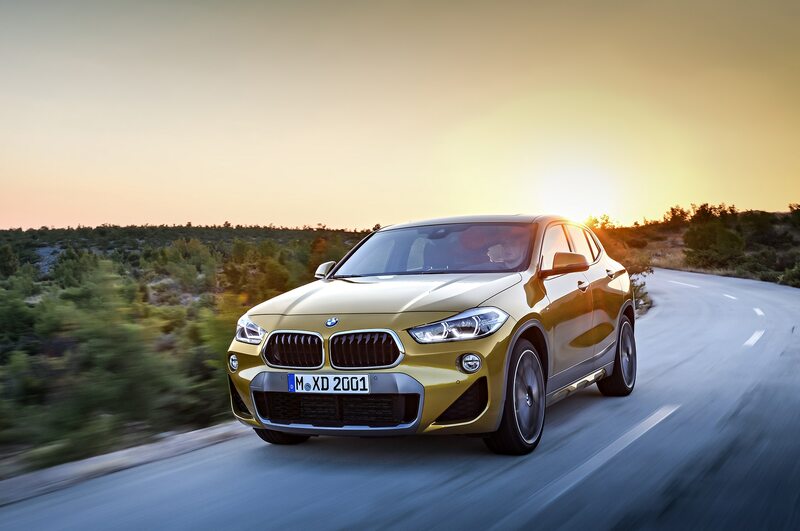 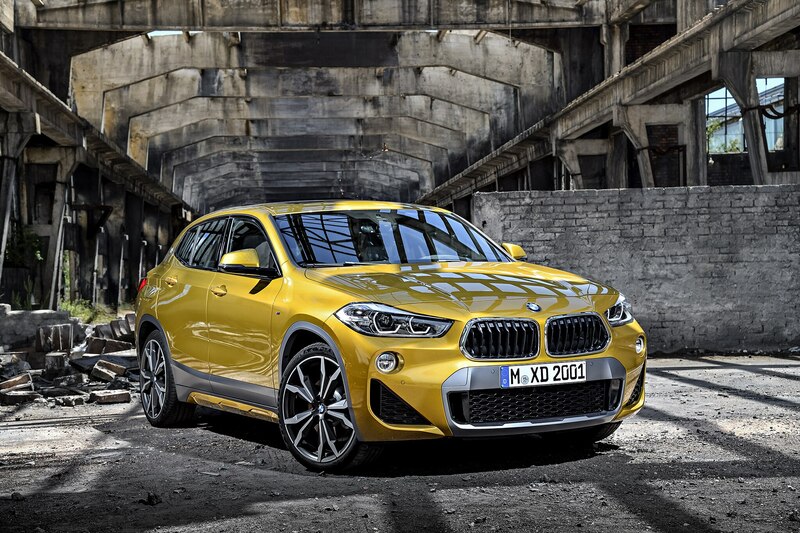 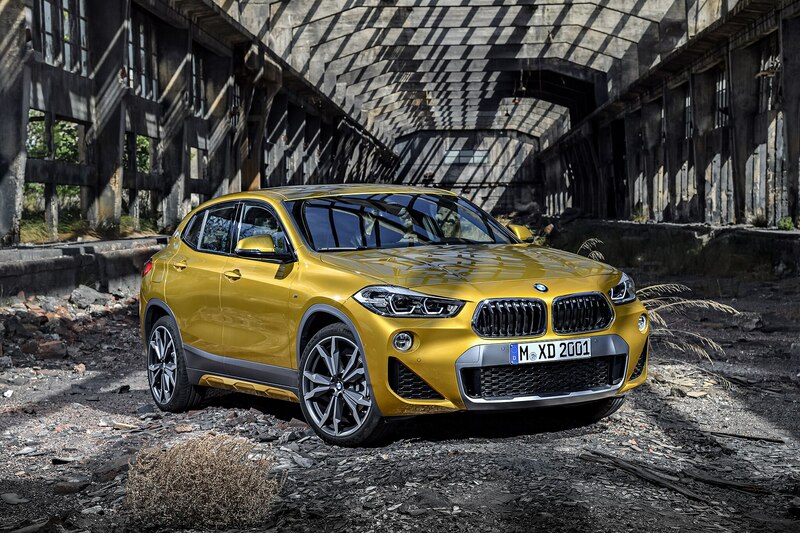 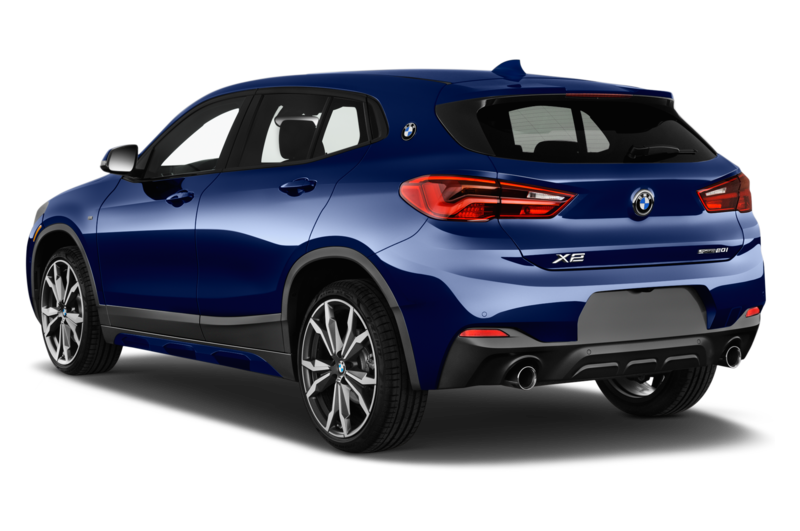 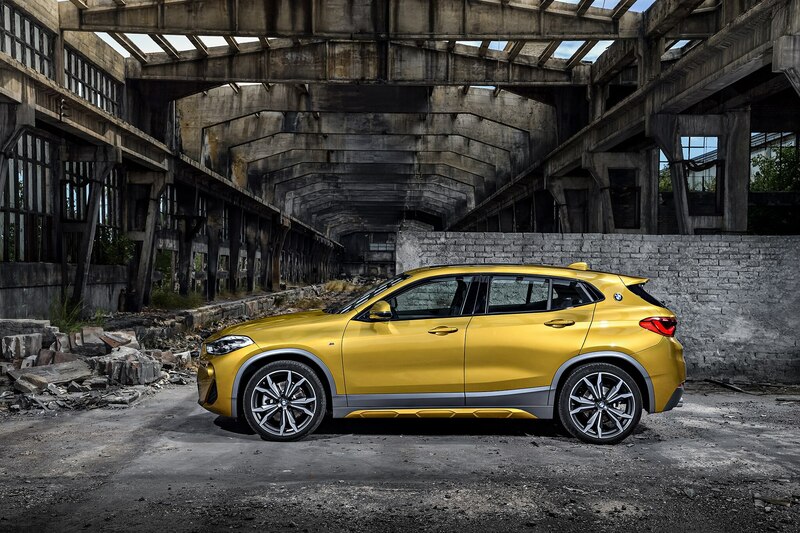 Our X2 was a 28i xDrive M Sport X with a premium tier package, which begins at $46,645 in the U.S. (The letter X denotes the X pack which combines dashes of contrasting gray paint with a neo-off-road body kit.) 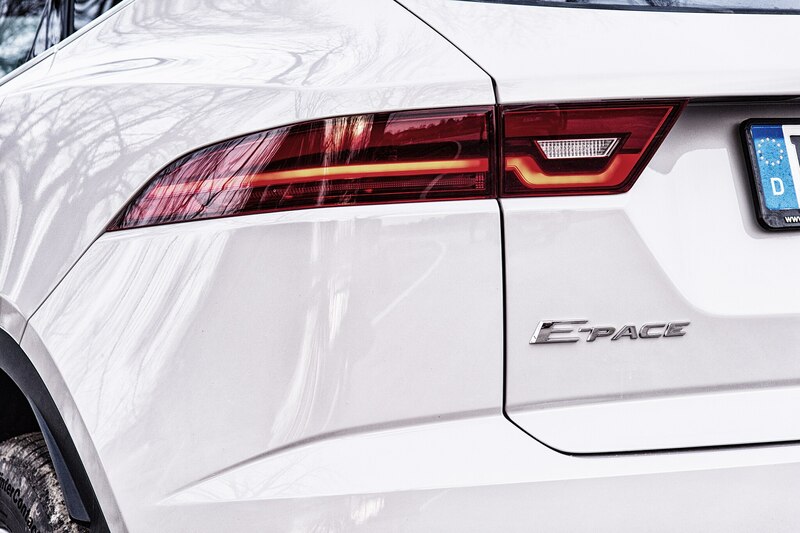 The E-Pace tester, a D180 launch edition with all-wheel drive, was on spec with an R Dynamic trim priced at $48,245. 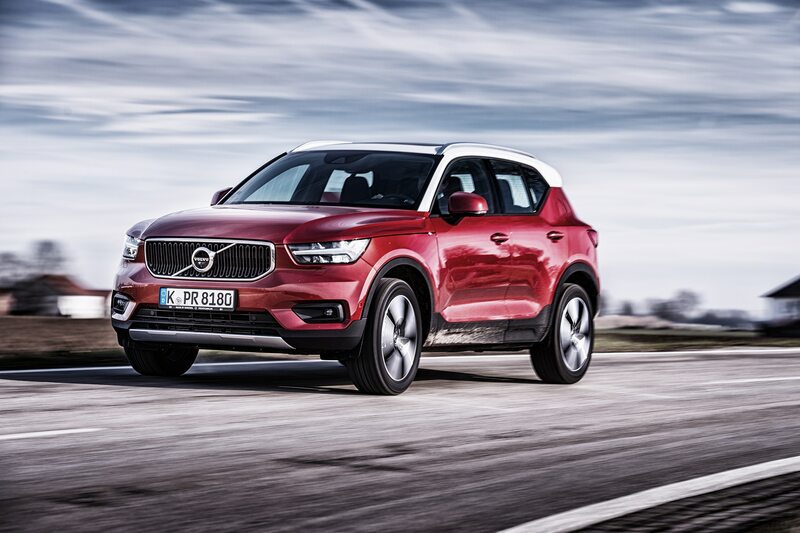 The Volvo invoice for the XC40 Momentum plus all available modern conveniences, including the eye-catching Red Cross livery, came to a relatively fair $39,820 (the Momentum trim starts at $36,195 in the U.S.). 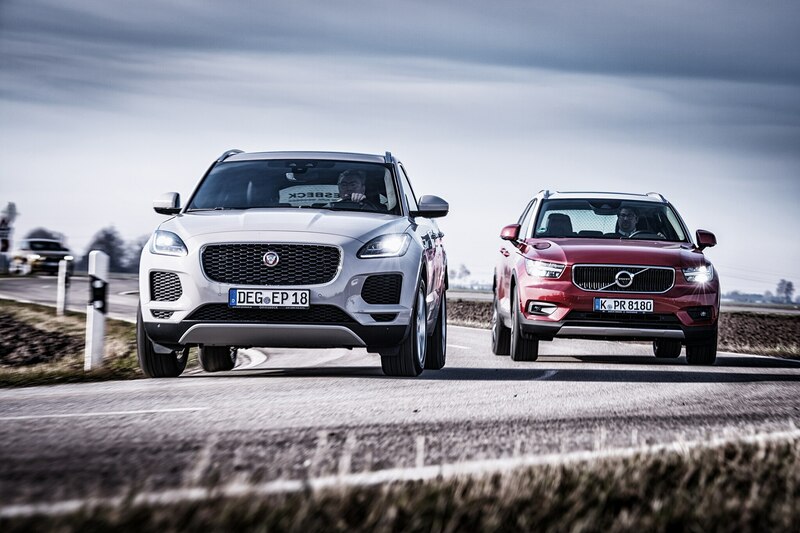 The diesel fours powering the X2 and E-Pace we tested produce an identical 190 horsepower and 295 lb-ft of torque, while the Volvo mill mixes less grunt at 180 hp with a little more twist (317 lb-ft of torque). 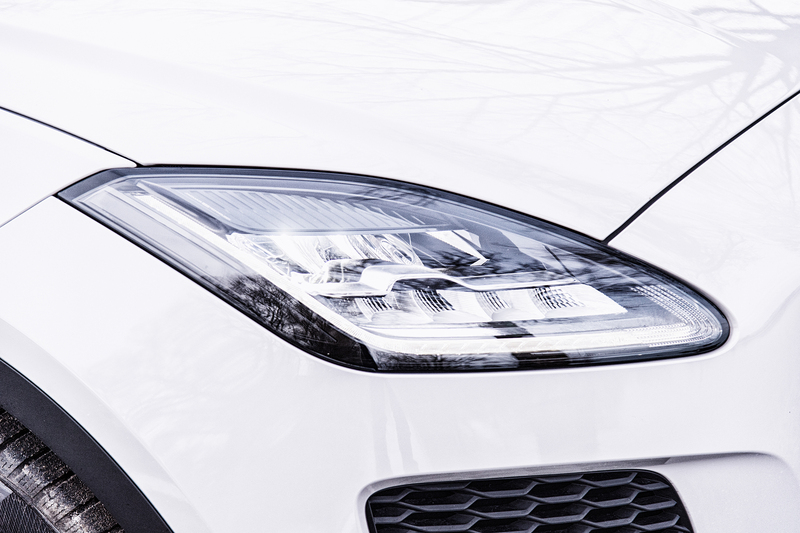 The same dead heat applies to the base gasoline versions. 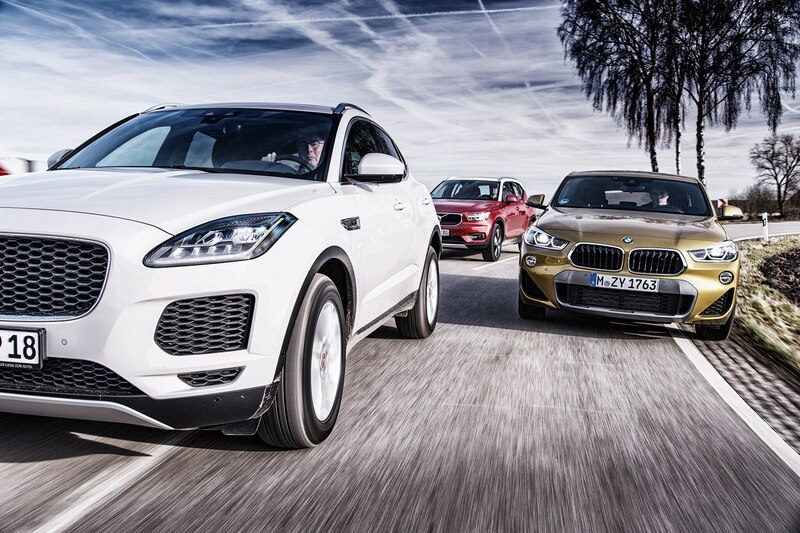 All are 2.0-liter turbocharged powerplants. 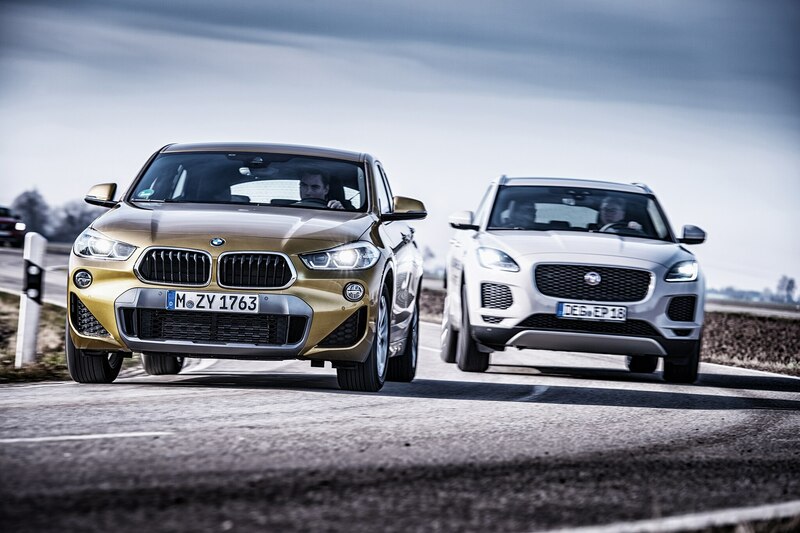 At 228 hp/258 lb-ft, the X2’s engine is only marginally less powerful than the 246 hp/269 lb-ft of the Jaguar and the 248 hp/258 lb-ft of the Volvo. 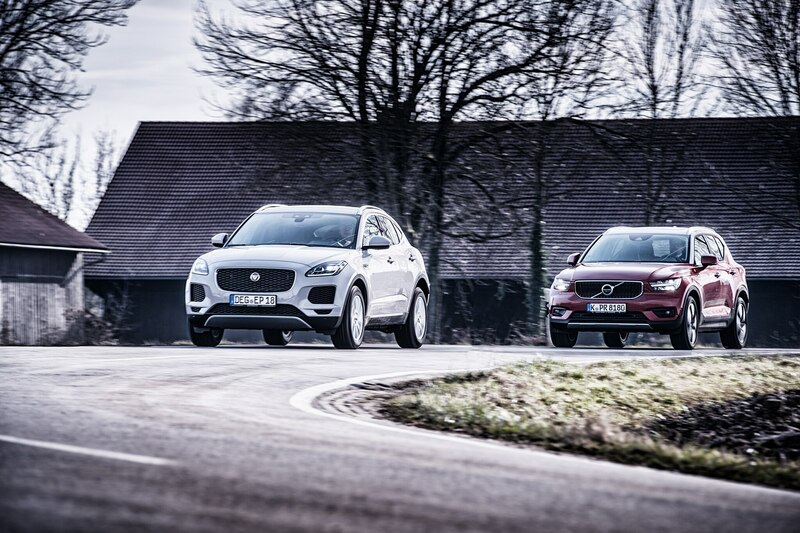 In the 0-60 mph sweepstakes, Volvo and BMW claim 6.3 seconds against the Jag’s 6.6. 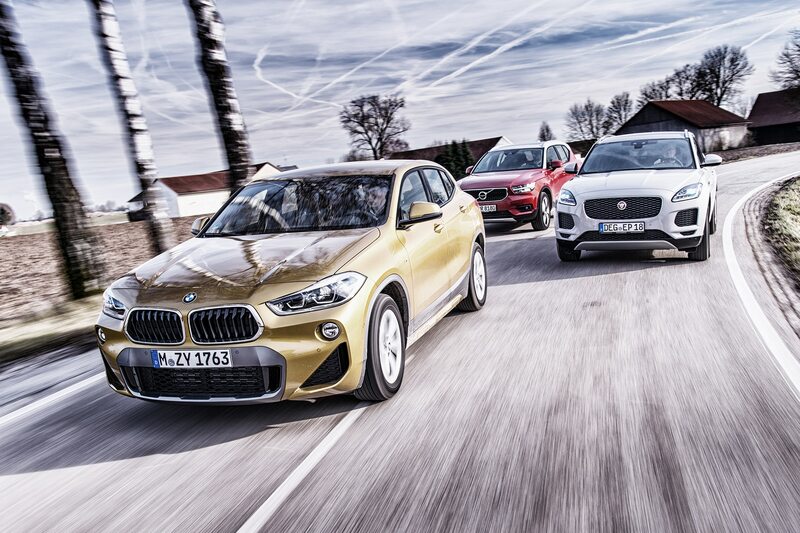 In terms of top speed, the 147 mph X2 narrowly leads the 144 mph XC40 and the 143 mph E-Pace. 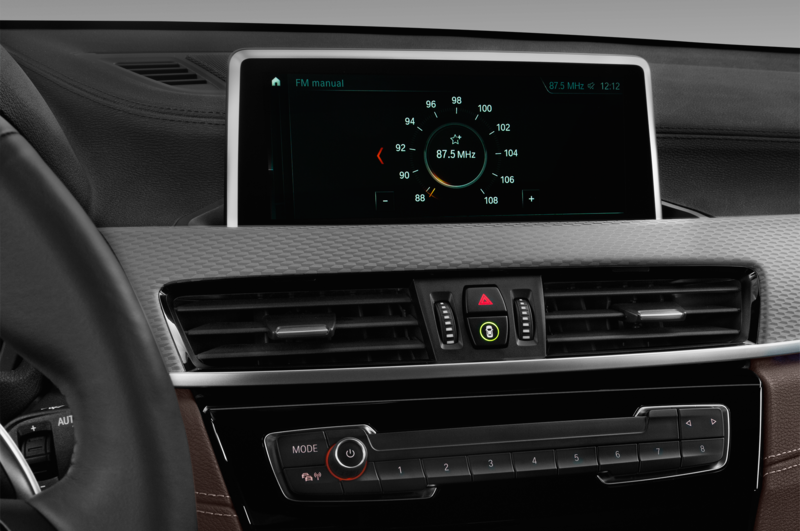 At least on paper, the transmissions are also remarkably similar. 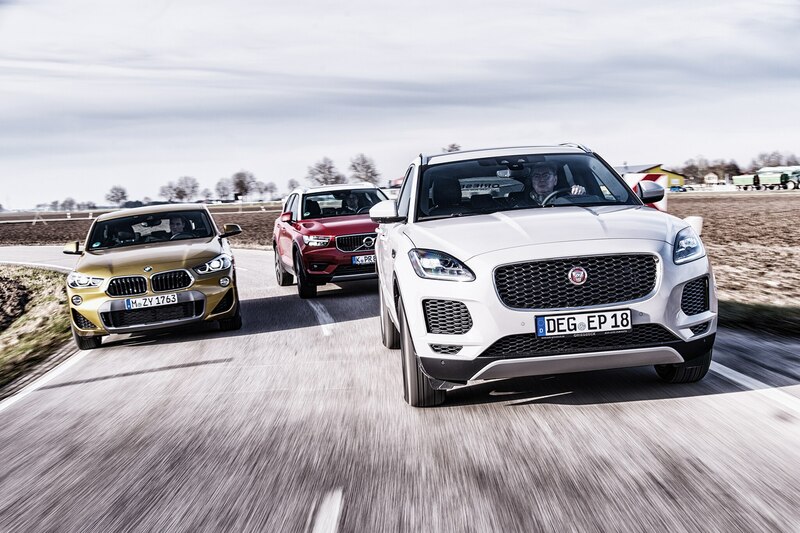 Munich and Stockholm opted for eight-speed automatic transmissions regardless of engine, while the team from Gaydon went for nine forward ratios. 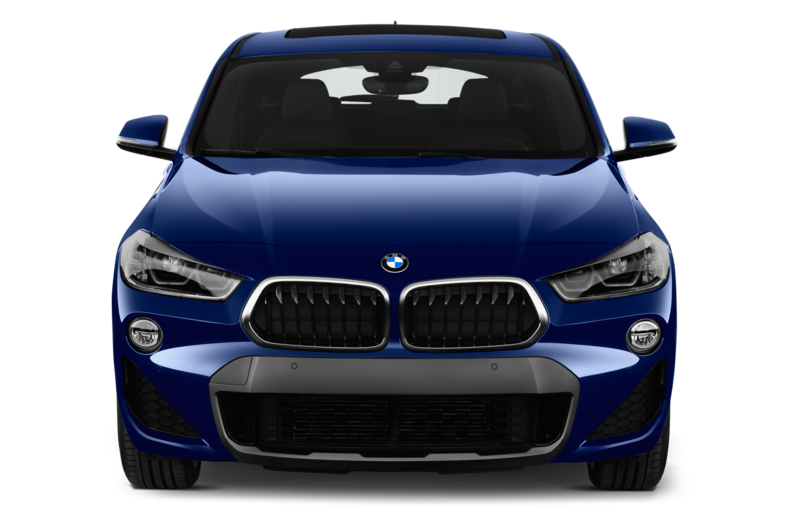 This almost analogical overall specification extends to the on-demand AWD systems which operate smoothly and efficiently. Due to the absence of transfer cases and mechanical differential locks, in extreme conditions it’s up to the traction control, ABS, and ESP systems to help achieve optimum stability when grip starts to slip. 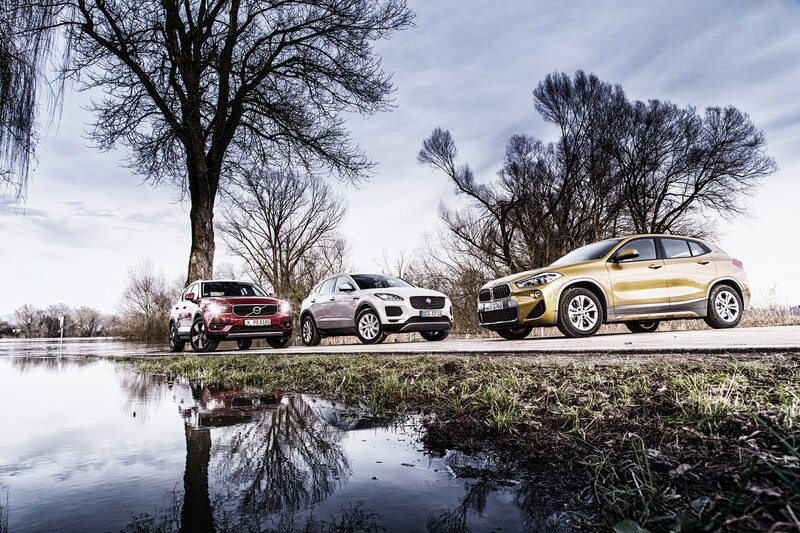 Although the X2 20d xDrive we drove is no rocket, it shrugs off its rivals on the autobahn with intriguing nonchalance. 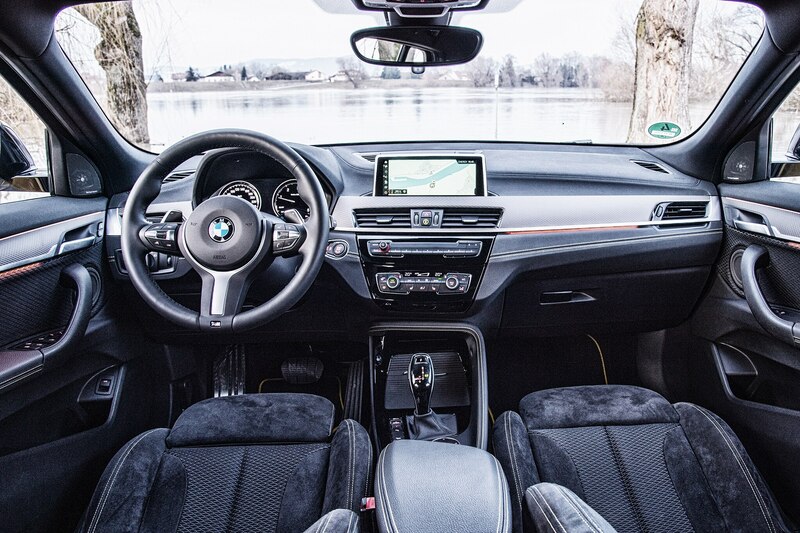 The optional sports transmission changes ratios that little bit quicker, the torque curve bypasses the typical holding pattern and shoots straight to the plateau at 1,750 rpm. 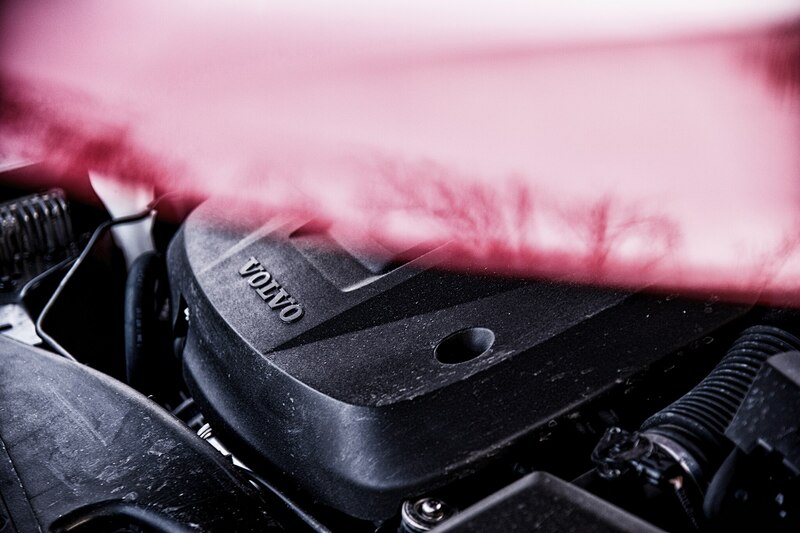 While the redline makes itself heard at 5,000 rpm, you have another 800 rpm before the chip-controlled hangman steps in. 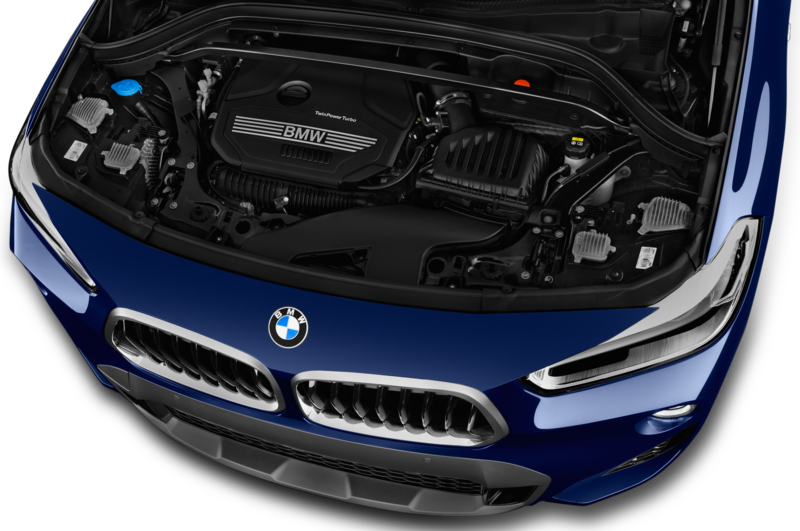 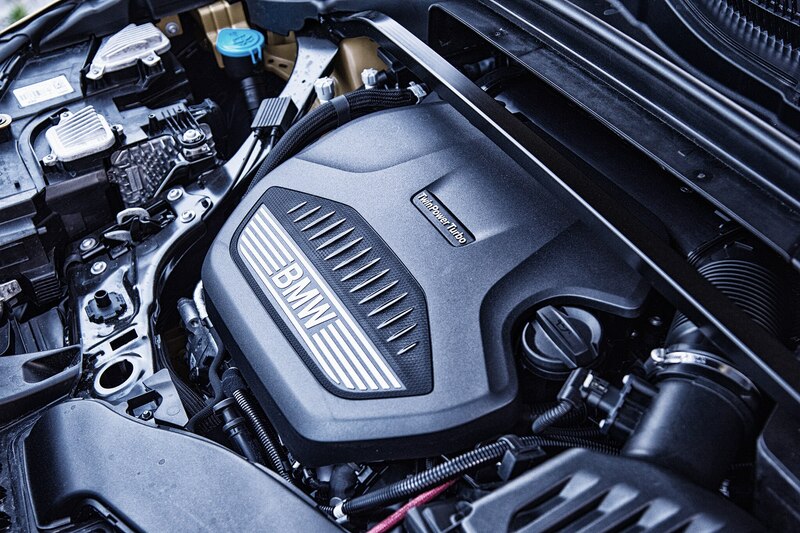 Compared to the competition, the BMW engine boasts a notably broader rev window that helps reduce the number of gear changes, and kickdown orders are applied obediently. 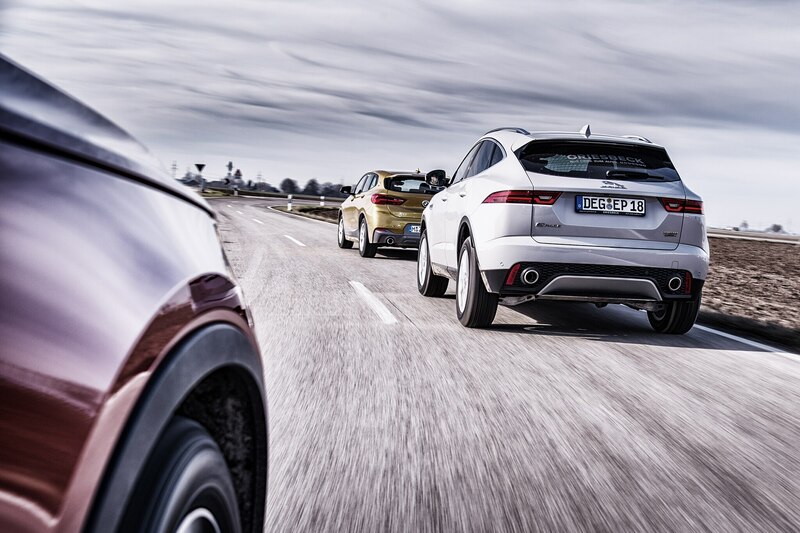 Having said that, this diesel knocks away like a woodpecker quartet when cold, the running characteristics are still more electric eel than pussycat, and when pushed hard the voice becomes loud and croaky. 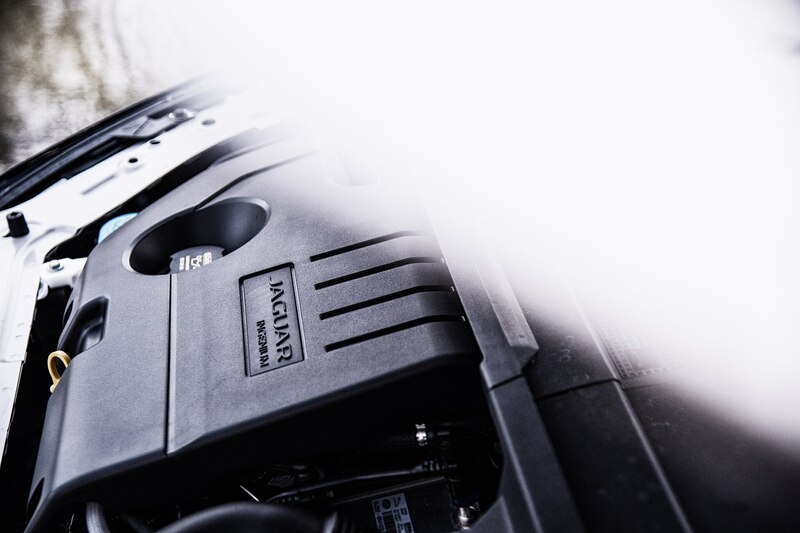 As for the Jag’s diesel engine, there are minor deficiencies when it comes to picking up revs (the cut-out speed is a modest 4,900 rpm), an inherent harshness which prevails throughout the entire rev spectrum, and relatively rough working noises. 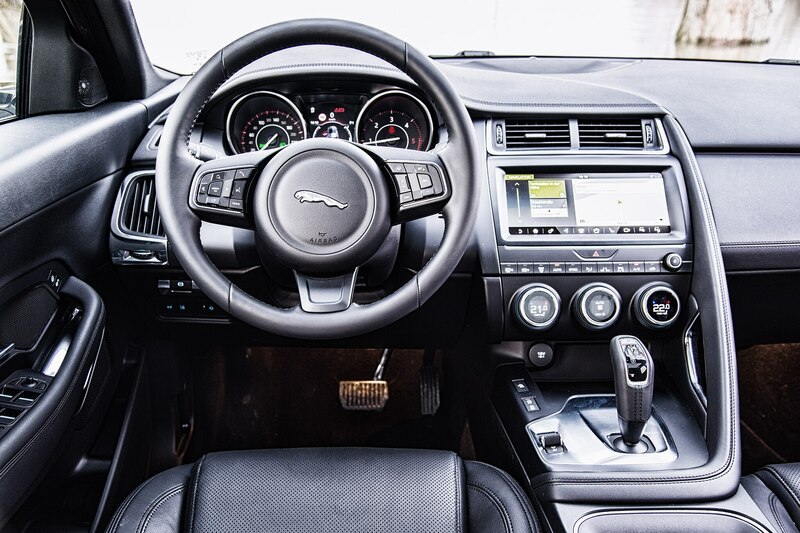 This unit is not refined, but at least Jaguar had the courtesy to mate it to a long-legged nine-speed automatic, which is a real relief on the freeway. 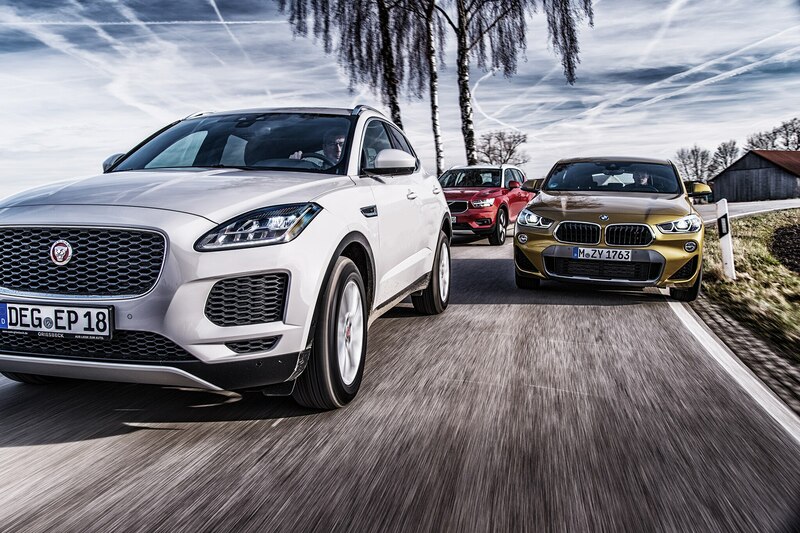 But the E-Pace’s biggest dynamic handicap isn’t the drivetrain but rather its hefty weight. 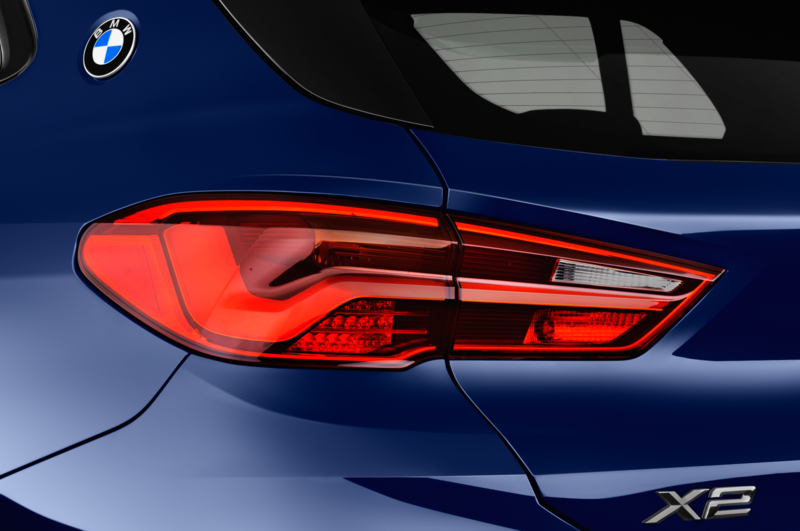 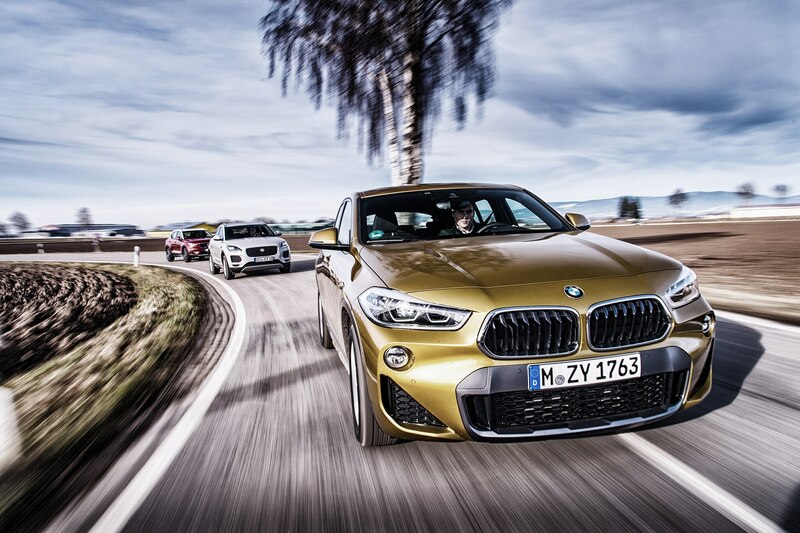 The 180D AWD tips the scales at roughly 4,063 pounds. 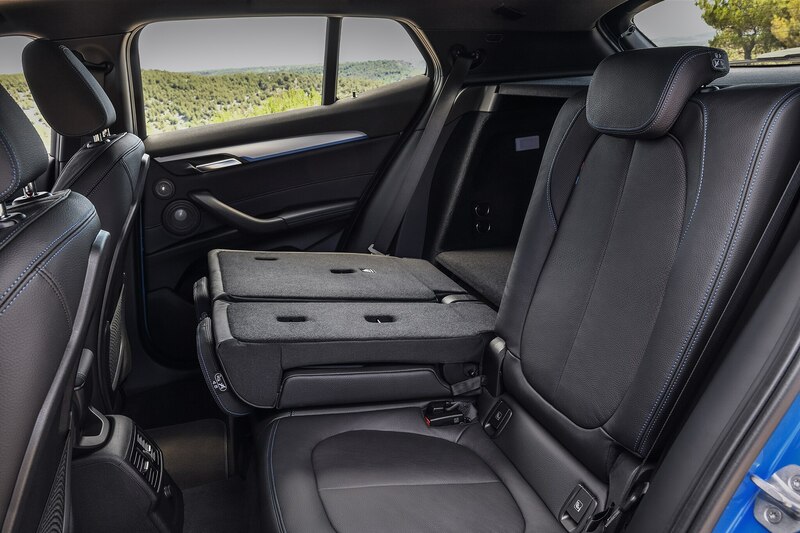 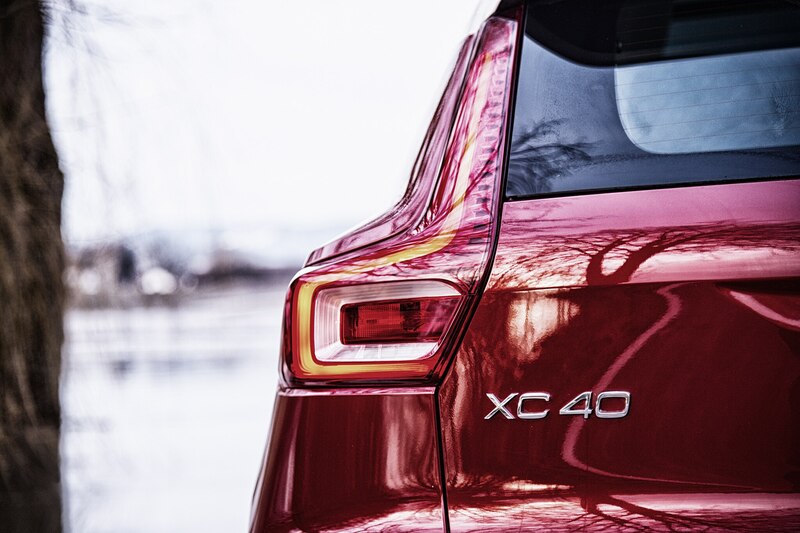 The XC40 is some 220 pounds lighter, while the X2 is trimmer and slimmer still at just south of 3,700 pounds. 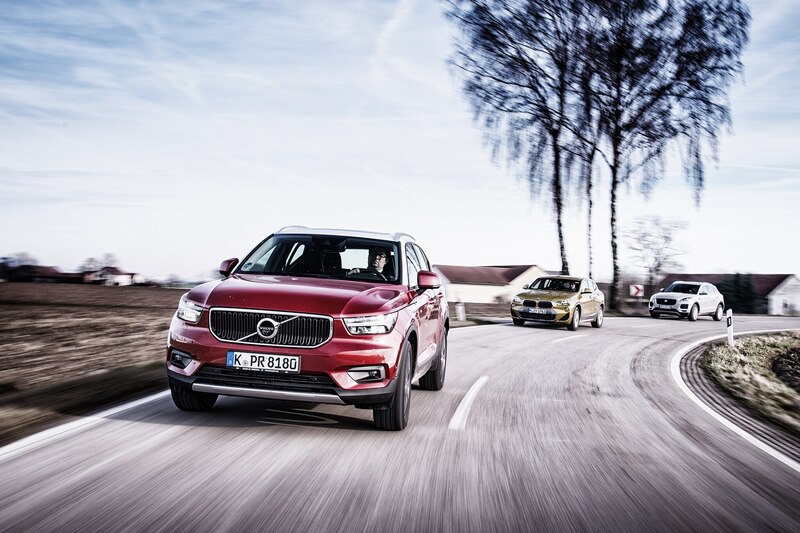 In the Volvo, it’s the Geartronic eight-speed automatic which makes us frown with disapproval. 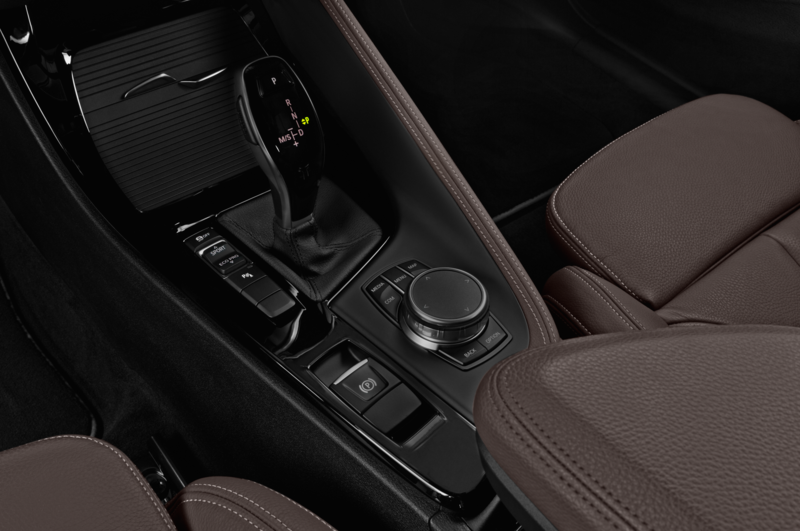 The absence of shift paddles is no big deal, but why do you have to hit the gearstick twice to set this car in motion? 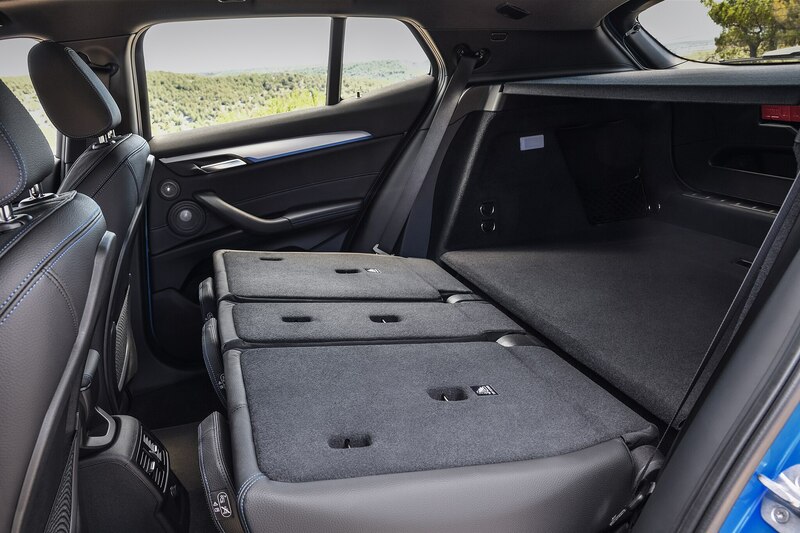 Answer: because the black box considers neutral to be an independent ratio you must deal with however briefly on the way to drive or reverse. 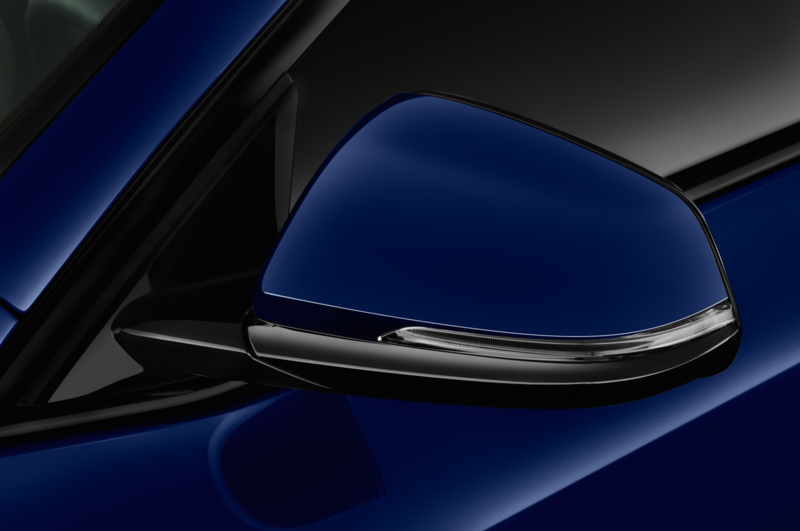 Even more disconcerting are the time-consuming upshifts and mushy kickdown action. 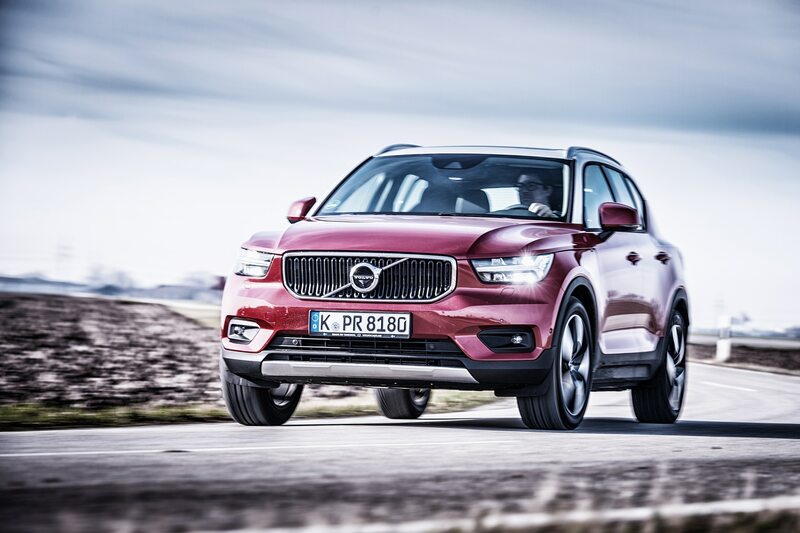 Although selecting sport mode speeds up the stroke rate, it does precious little to improve the sluggish ramp performance, a drawback the XC40 shares with its contenders. 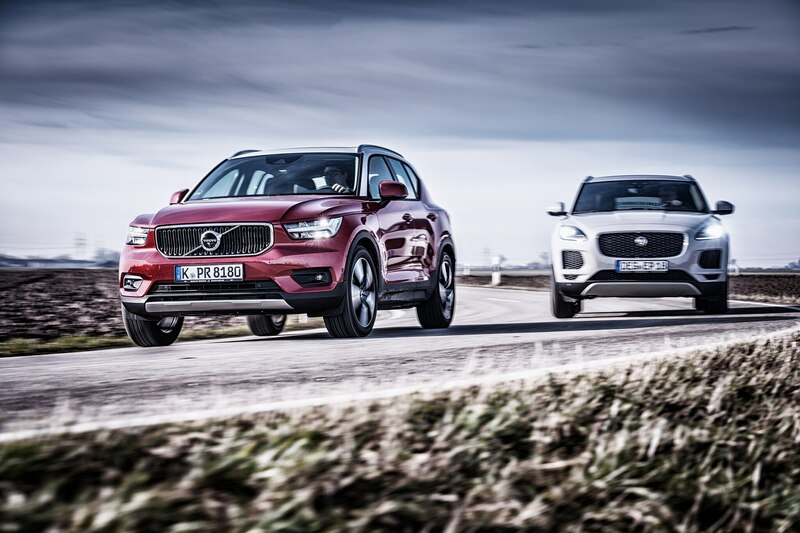 Like the E-Pace, the Volvo permits some mid-range turbo lag which is more irritating than annoying. 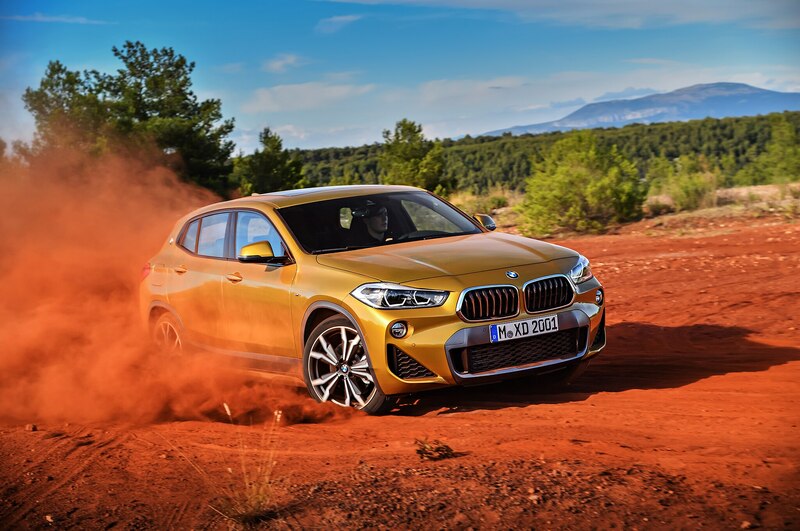 Although perfectly capable of leaving the beaten track and embarking on junior grade adventure trails, these three are in reality too precious for such detours. 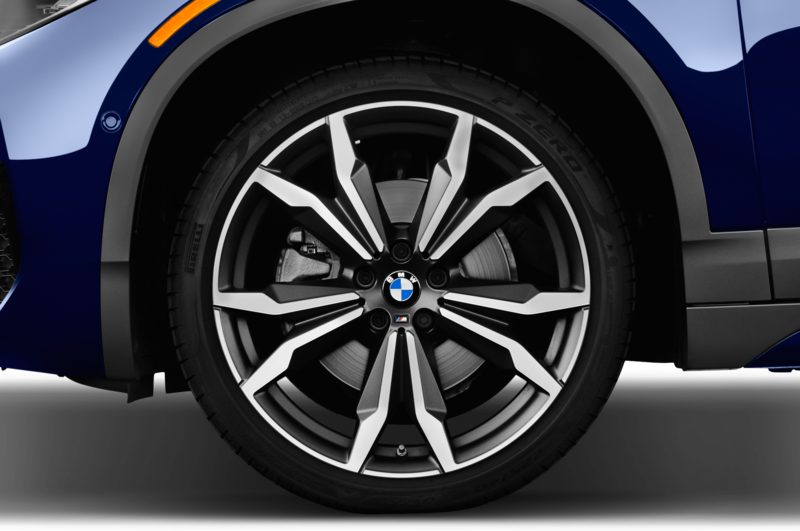 You see, the shiny wheels cost a small fortune, the protective undertrays are of purely cosmetic nature, and the very first close-range mulberry bush is bound to leave nasty scratch marks on the glossy paint. 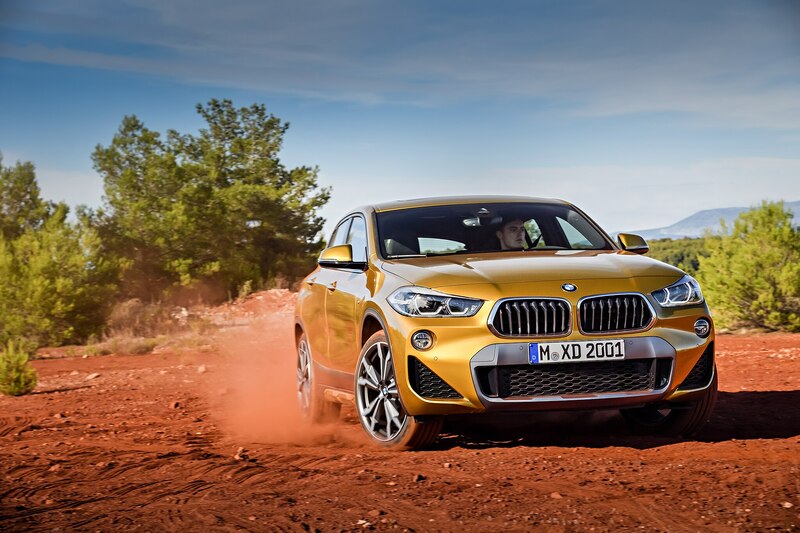 No, the stages this cast performs best on are little-trafficked roads garnished with a few dozen interesting corners and a wide variety of surfaces from rutted and weather-beaten to polished and fast. 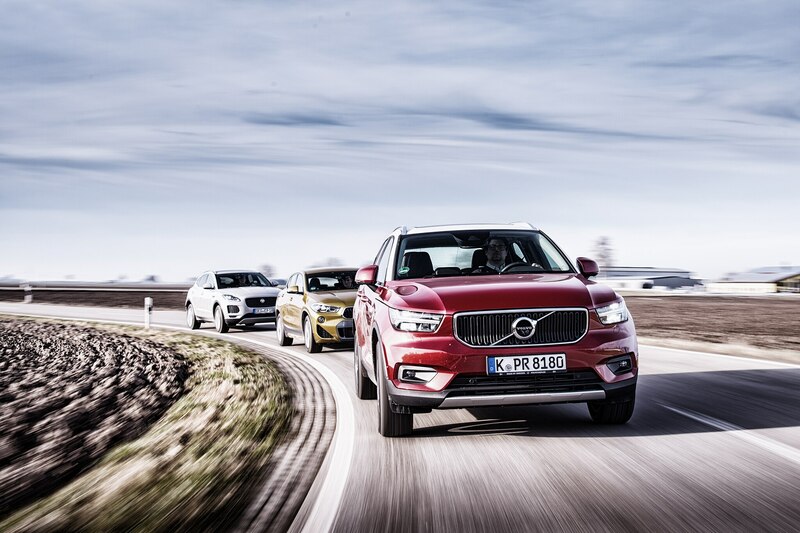 The B8 between Deggendorf and the Czech border is a wide-open playground, and here the XC40, E-Pace, and X2 stay much closer together than on the autobahn. 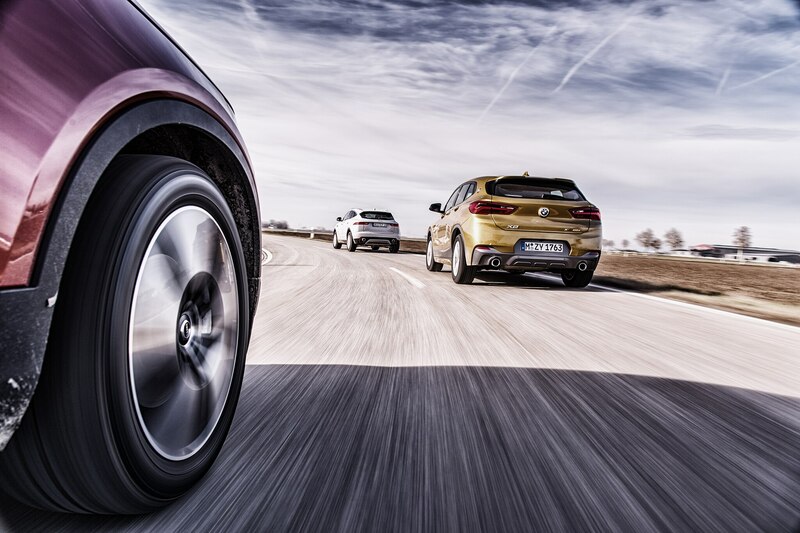 Despite low-grip 17-inch winter tires, the BMW still edges the others thanks to enhanced cornering grip and confidence-inspiring steering feedback all the way to the limit. 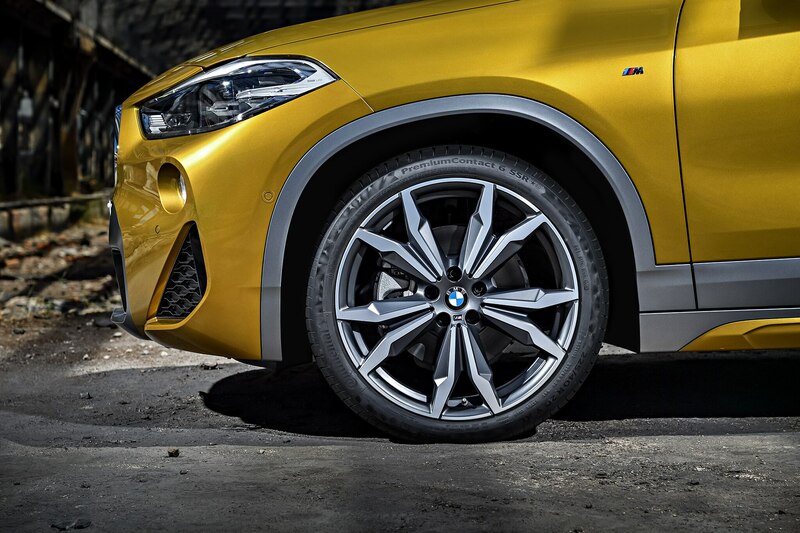 The sole serious flaw of the X2 is the unsettled ride, which can be downright harsh on broken pavement. 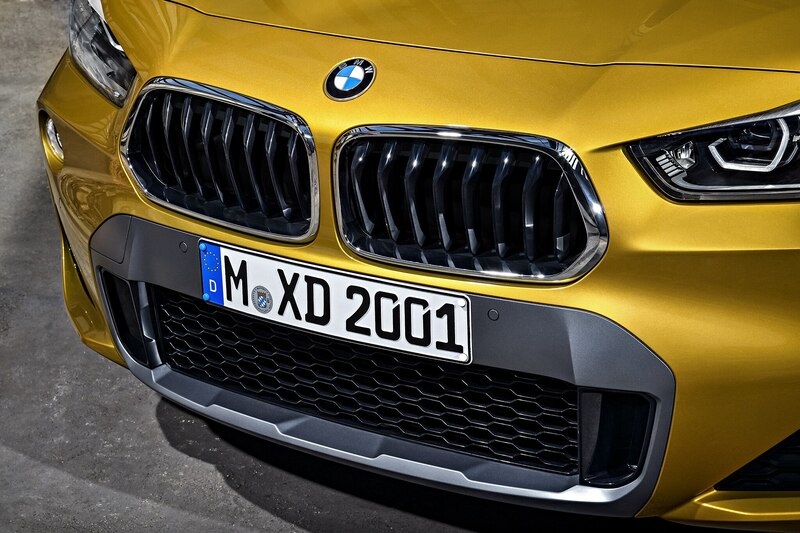 Even in Comfort mode, the restless M sport suspension is an issue on all but the smoothest tarmac. 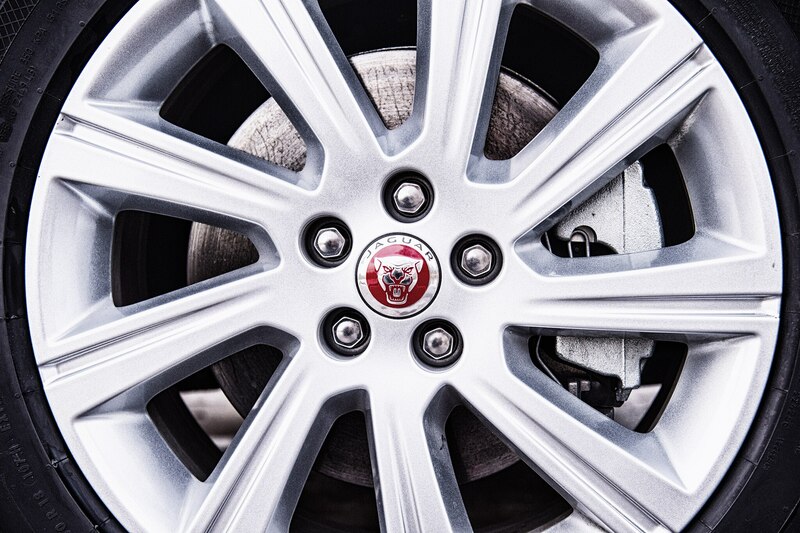 In this particular environment and against strong opposition, it’s the Jag that clinches the fine ride award. 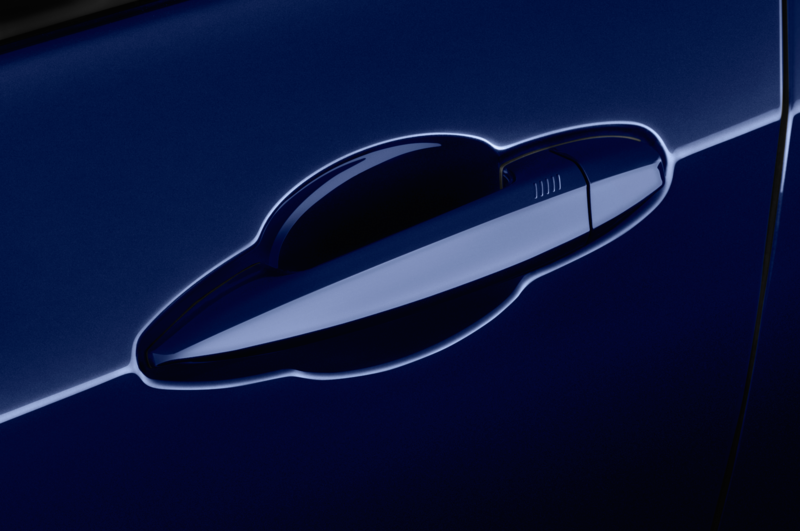 Unexpected, Yes. 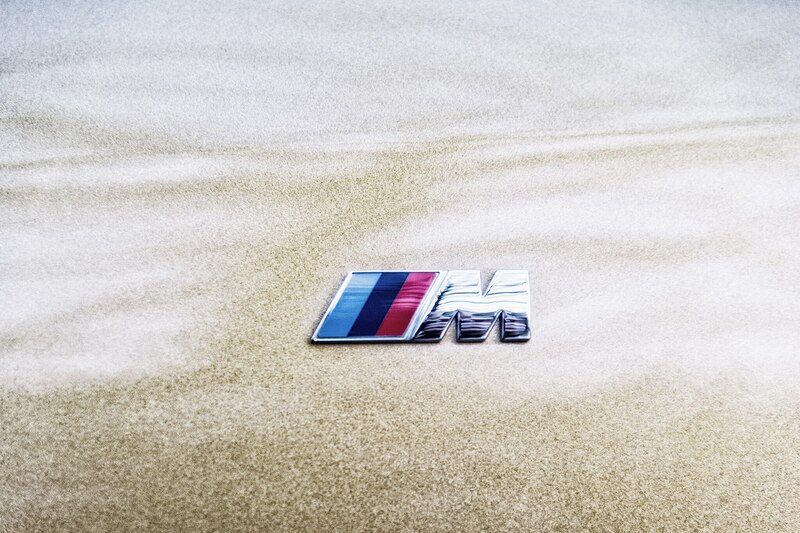 Undeserved, No. 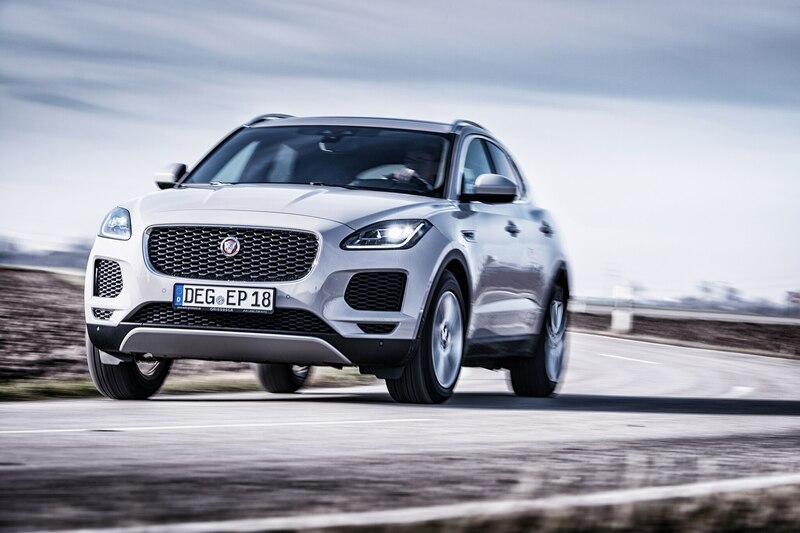 True, the E-Pace hates corrugations and dislikes manhole covers. 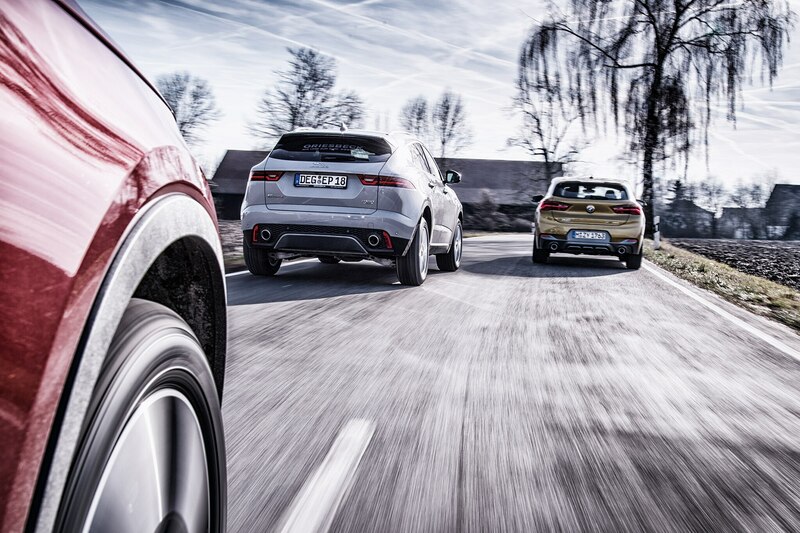 Shod with 235/60 18-inch mud and snow tires, however, spring travel suffices to wade through potholes, damper action copes well with the wavy stuff, and the entire suspension setup feels more homogenous than the chassis of the Range Rover Evoque we brought along as a reference vehicle. 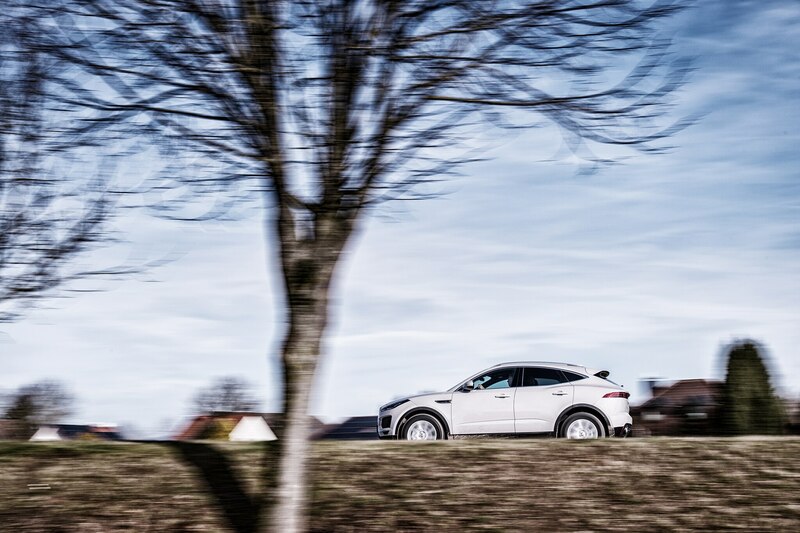 Even though brake dive and body roll can be an issue when you start letting it all hang out, the E-Pace’s lateral, longitudinal, and horizontal movements are at peace with each other. 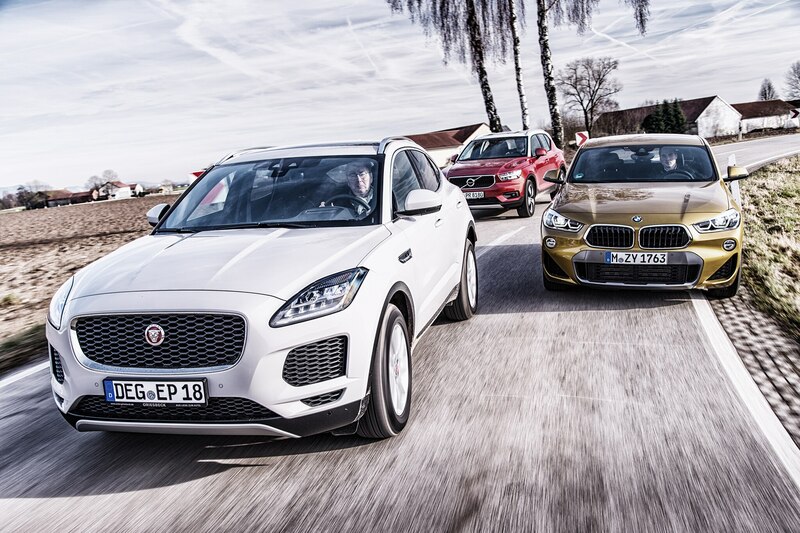 The gap between Jaguar and BMW is—surprise, surprise—filled by the Volvo. 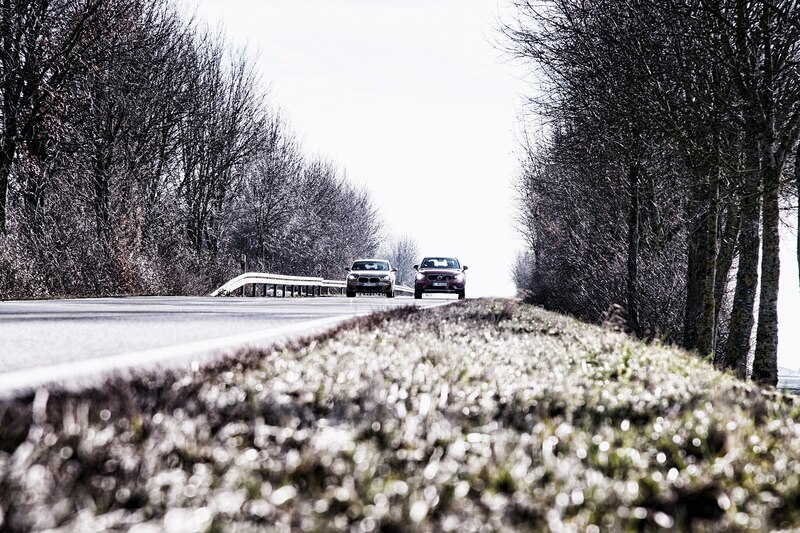 The only entrant equipped with XXL 19-inch winter season tires, the Swede feels stiffer sprung, tauter damped, and more stilted and upright than the Brit. 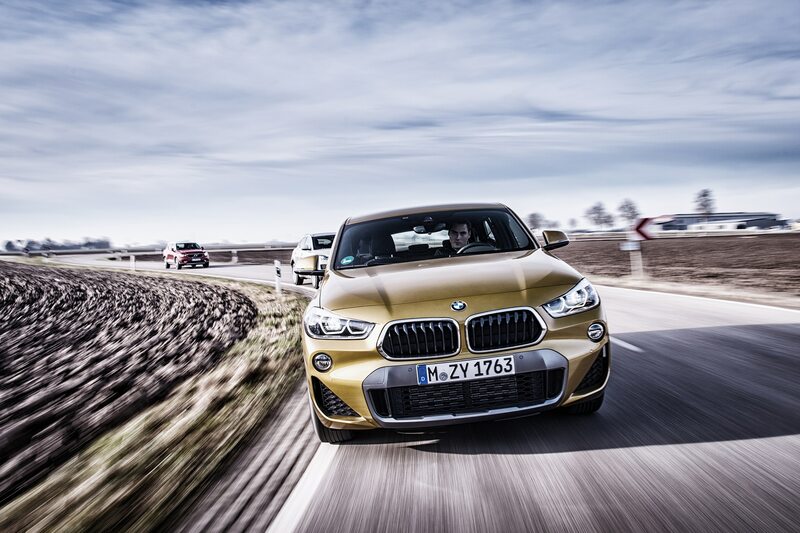 The low-speed ride isn’t as brittle as you might expect, and longer undulations are taken care of with aplomb. 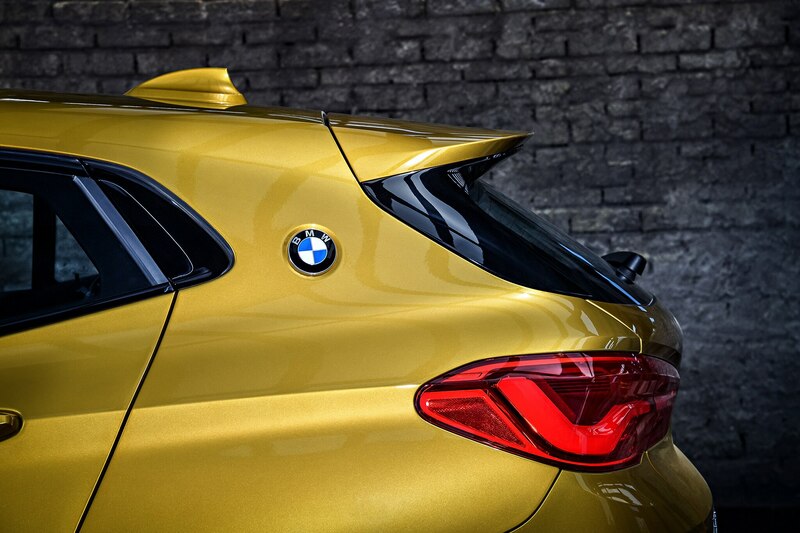 Successive transverse irritations are not appreciated across the board here. 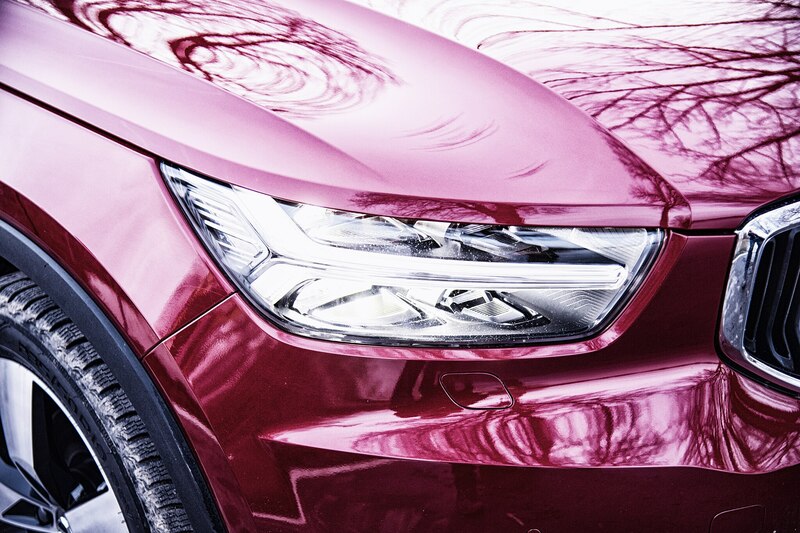 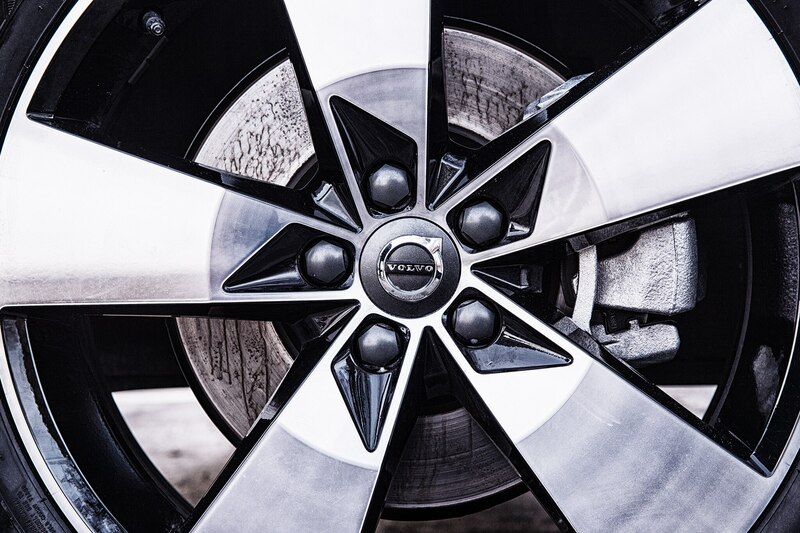 It is easy to befriend the Volvo’s steering and brakes. 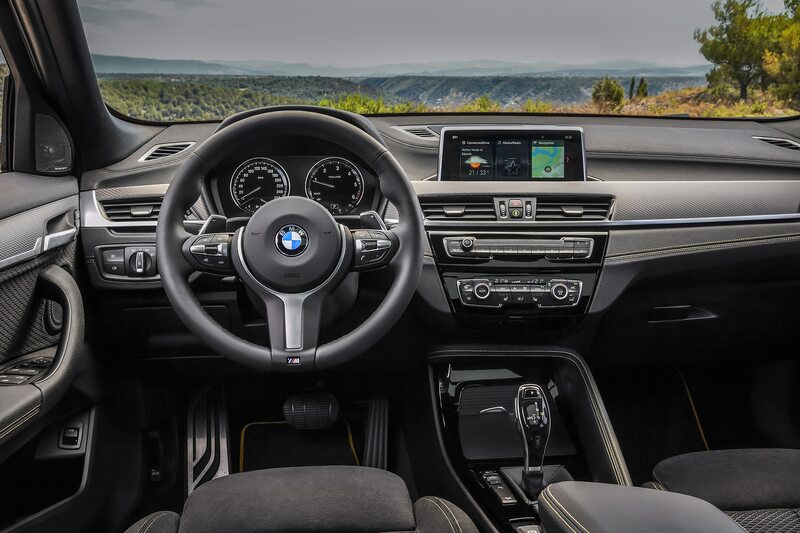 Turning the wheel feels a bit more detached than in the BMW but not as artificial as in the E-Pace. 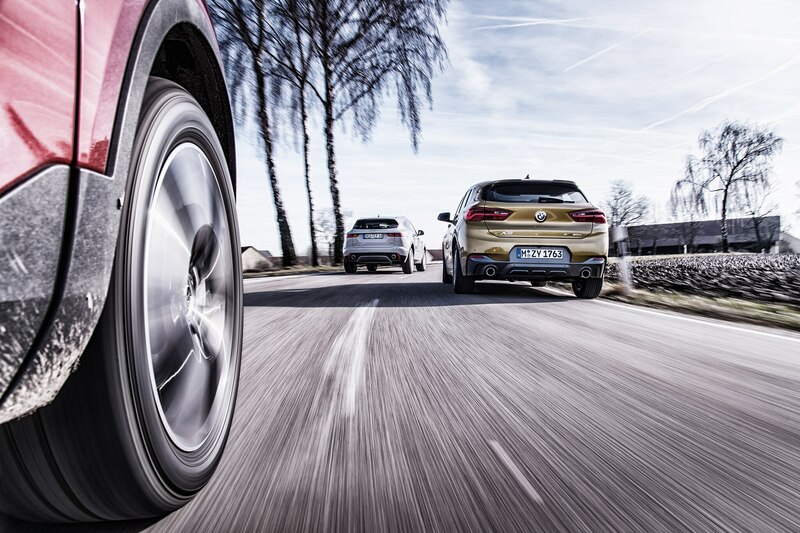 Deceleration is an intuitive sequence of early bite followed by plenty of stopping power, which soon calls for more pedal effort. 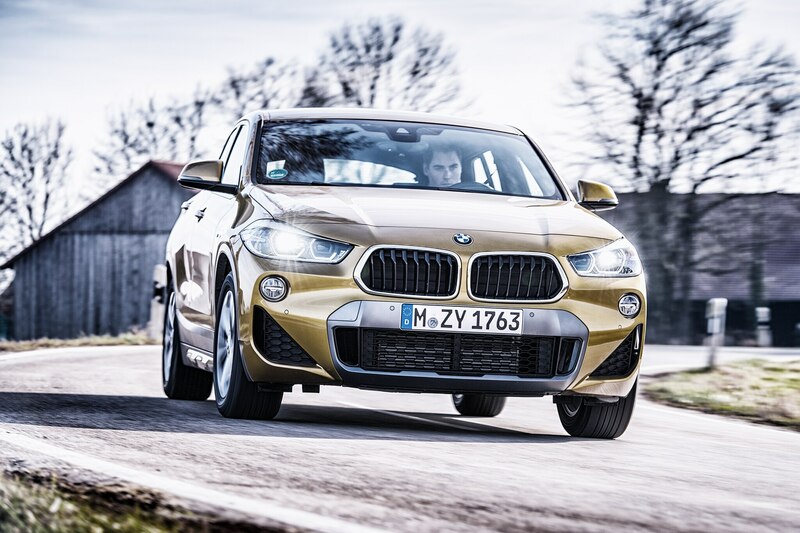 The handling characteristic fuses mild understeer with unambiguous response and unflappable stability. 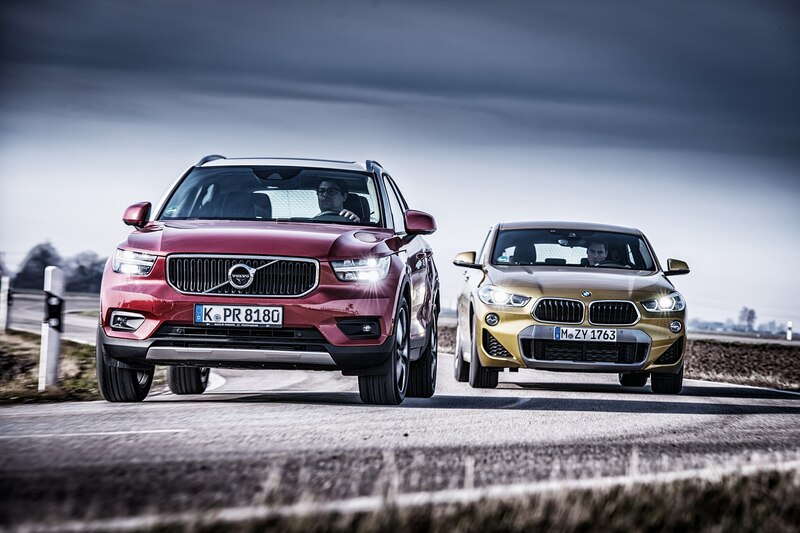 While the X2 and E-Pace clip apexes with more bravado, the XC40 scores brownie points for its relaxed cornering attitude and reassuring handling balance which borders, Volvo-style, on the anonymous. 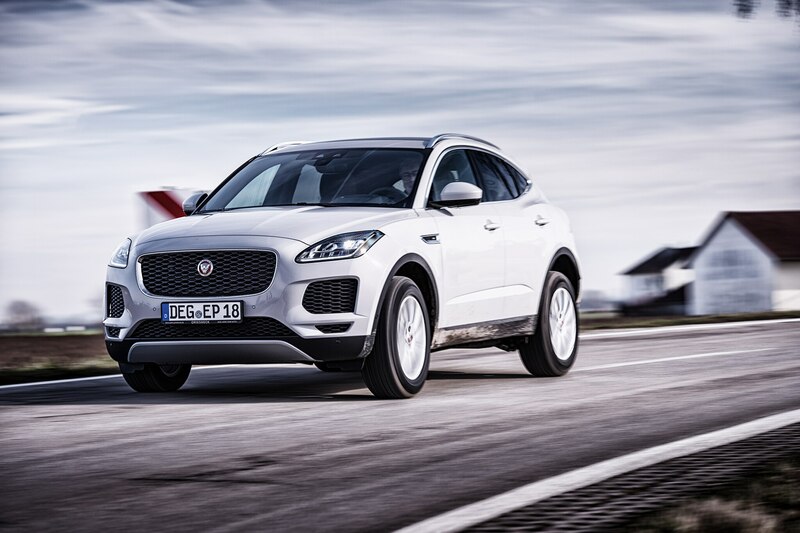 The E-Pace cultivates a more shirt-sleeved attitude, turning-in with extra zest and responding quite aggressively to throttle inputs when in low gear. 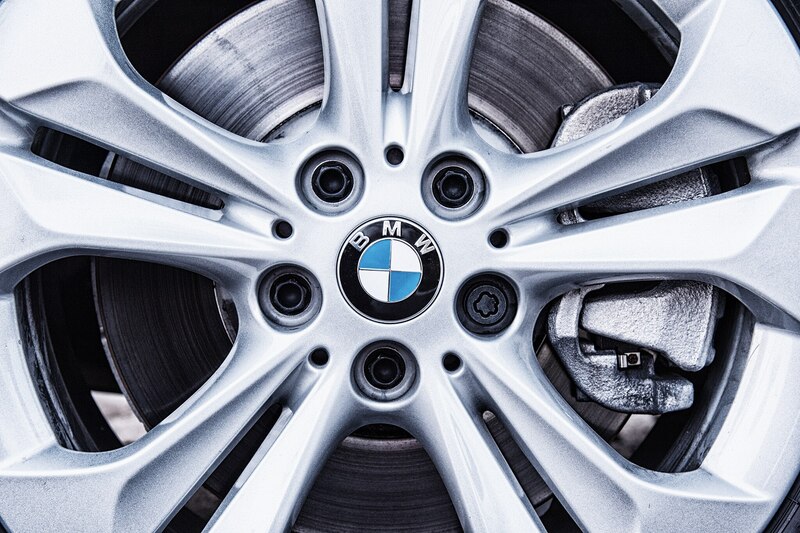 It is always eager to brake a little later, then a little later still. 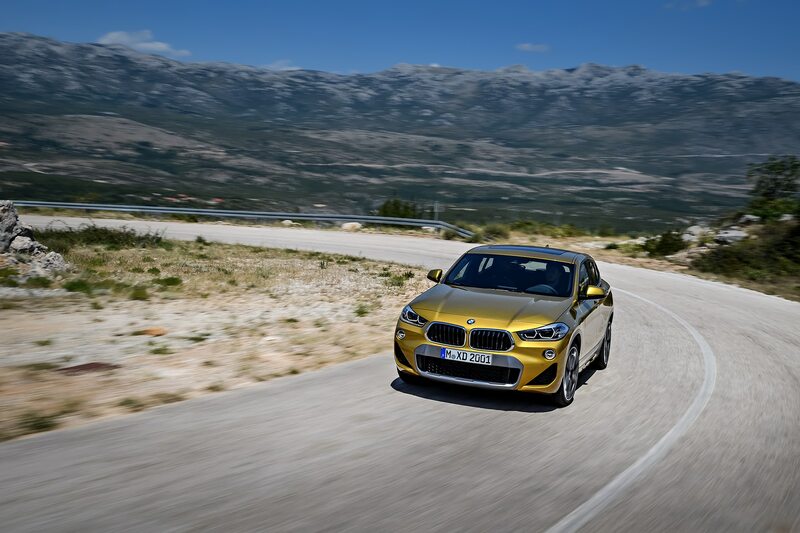 Subjectively, it is no faster around bends, but its captivating enthusiasm stirs more emotions, especially in dynamic mode and through courage-testing corners where the extra weight is less of an issue. 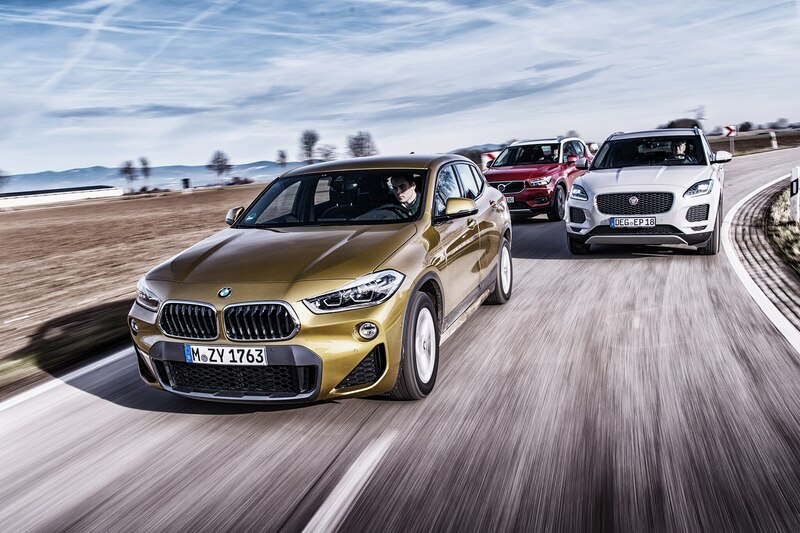 Just as you begin to admire the Volvo for its balance and the Jaguar for its ambition, the BMW is next in the rotation, and sure enough it takes us back to square one. 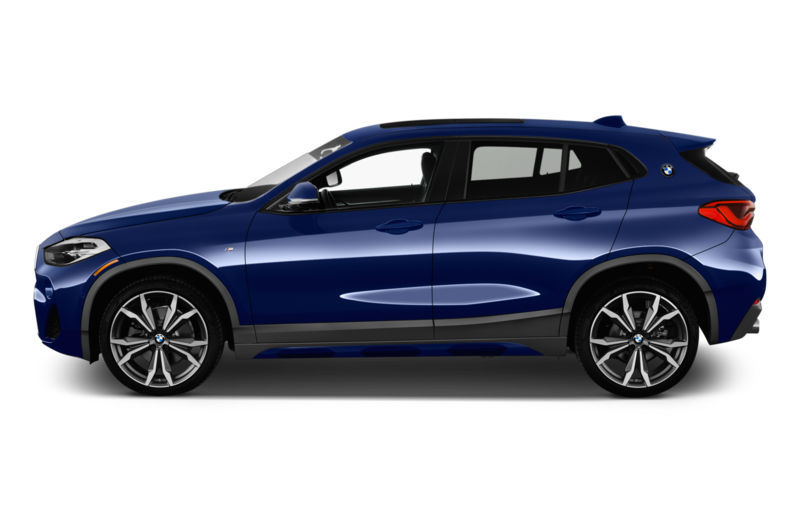 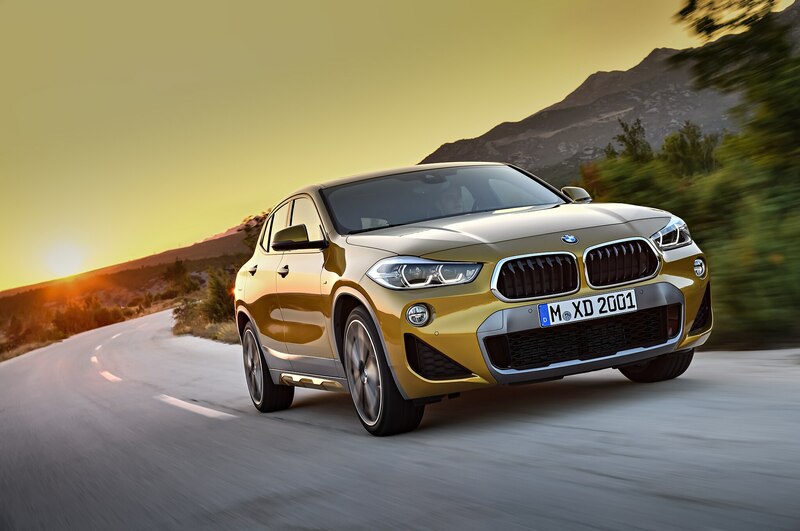 Once again, the X2 confirms its ability to eclipse its rivals on just about every rung of the driving-pleasure scale. 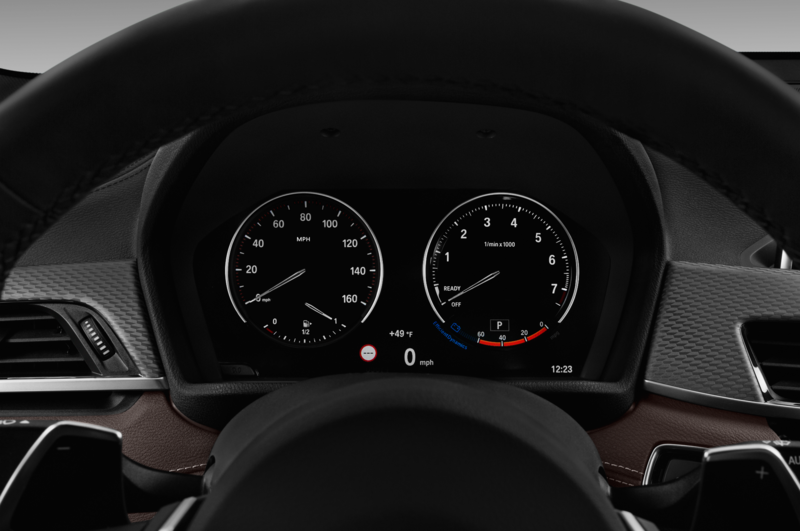 Its steering conveys an extra touch of accuracy, promptness, and transparency. 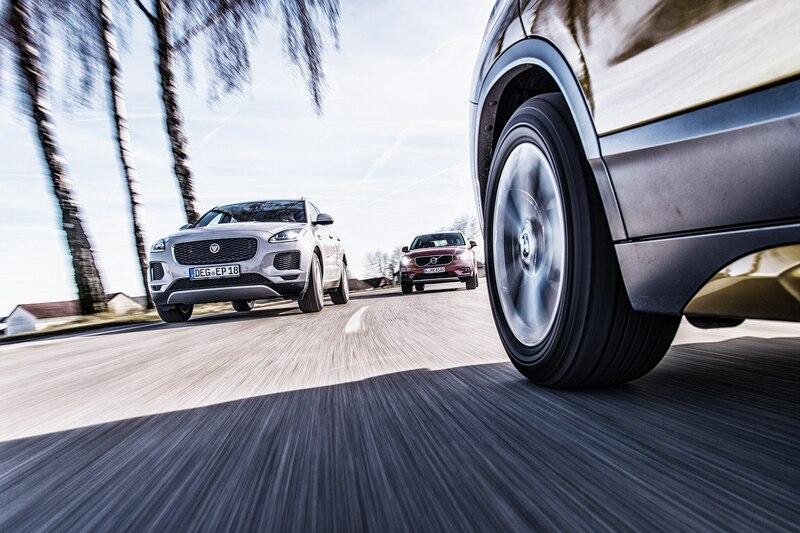 Its brakes are relentless, energy-squashing pros. 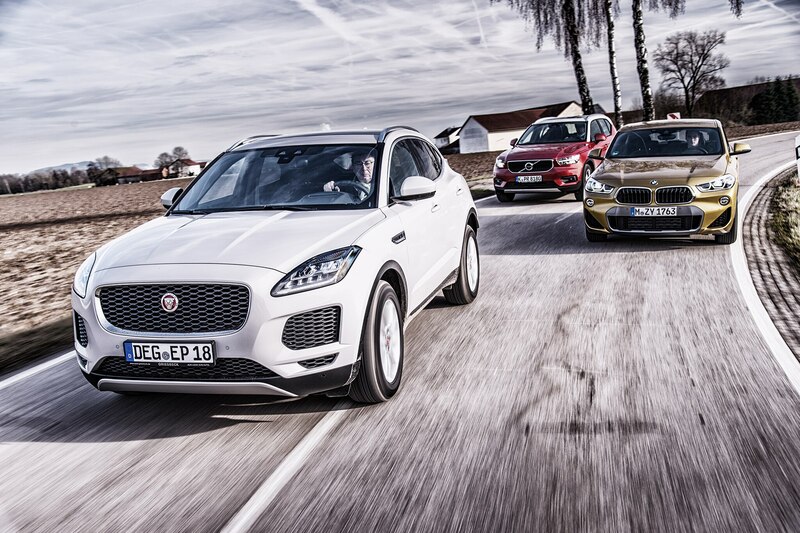 Its suspension hits the middle ground between Snow White and The Big Bad Wolf. 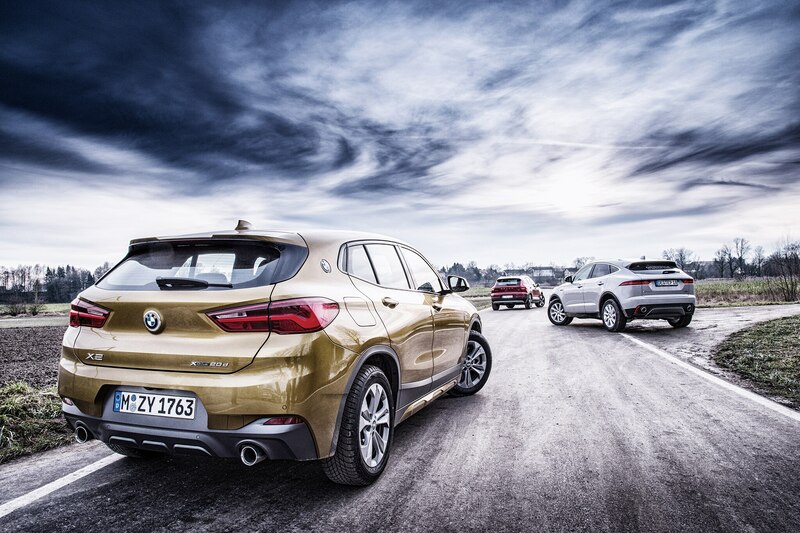 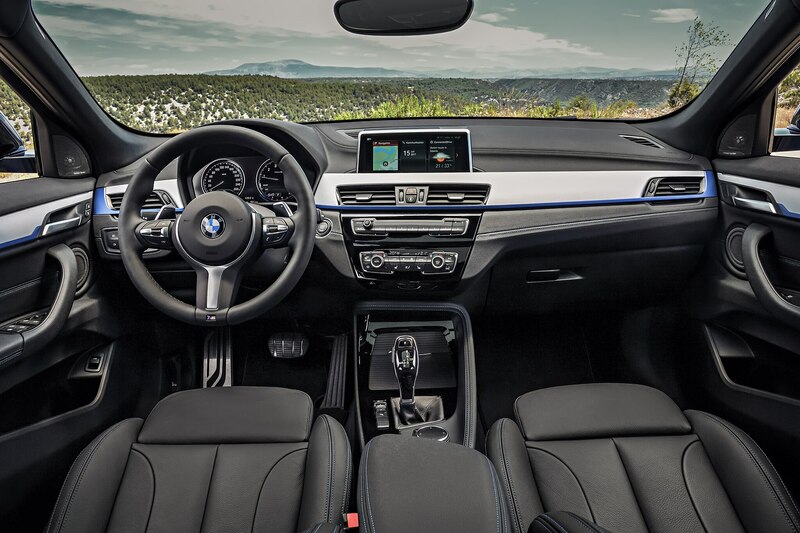 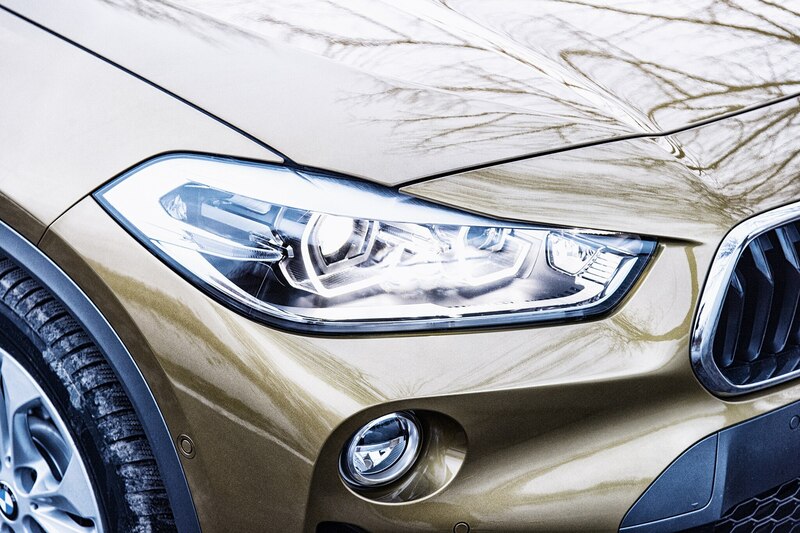 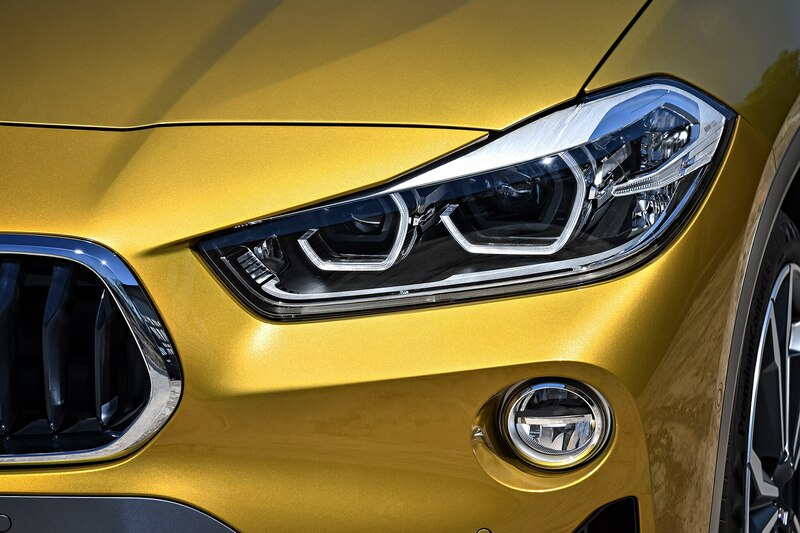 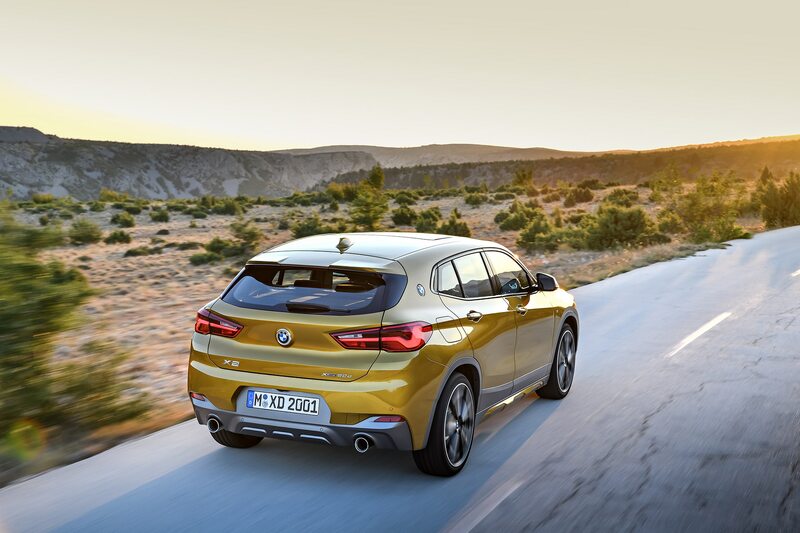 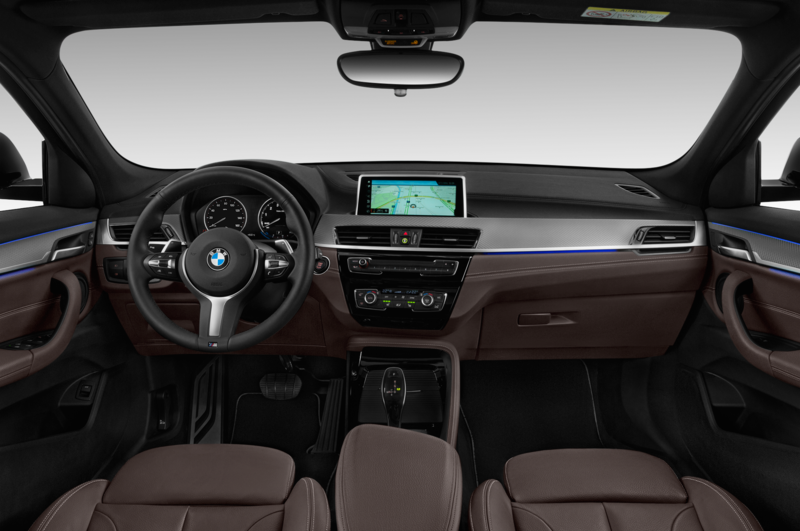 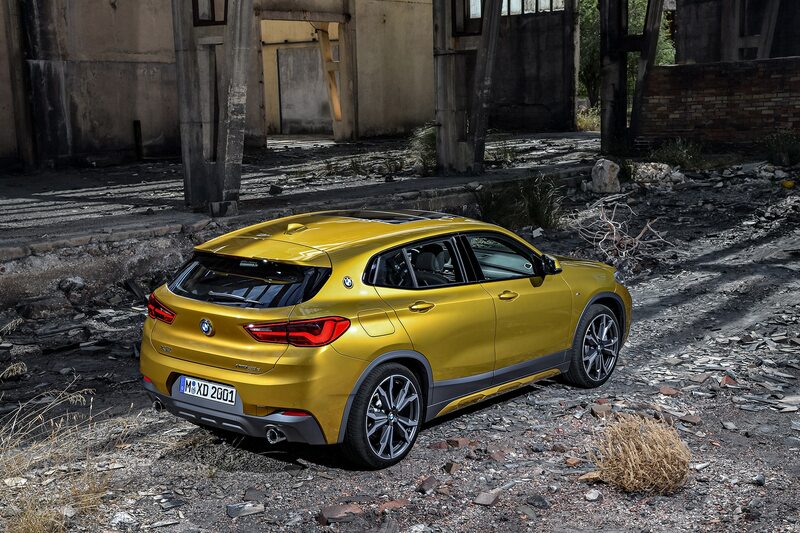 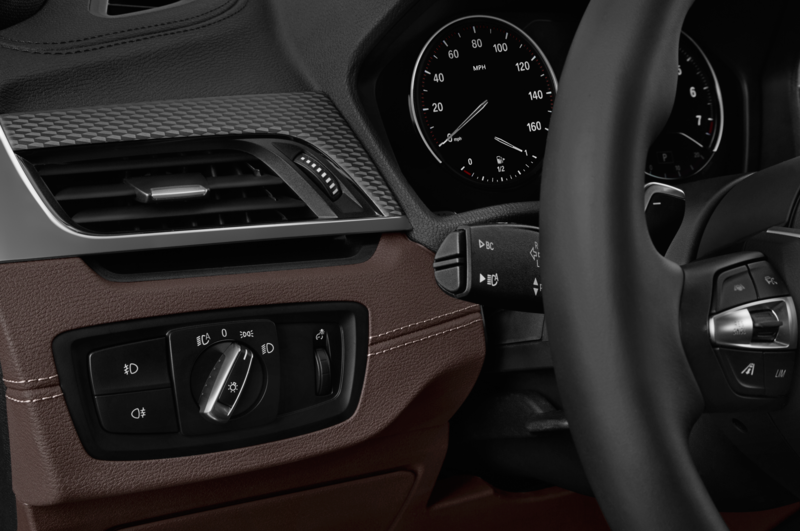 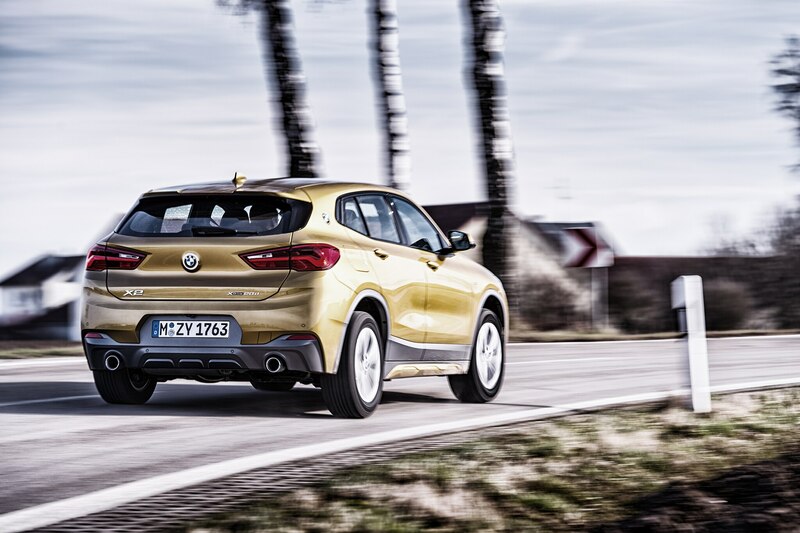 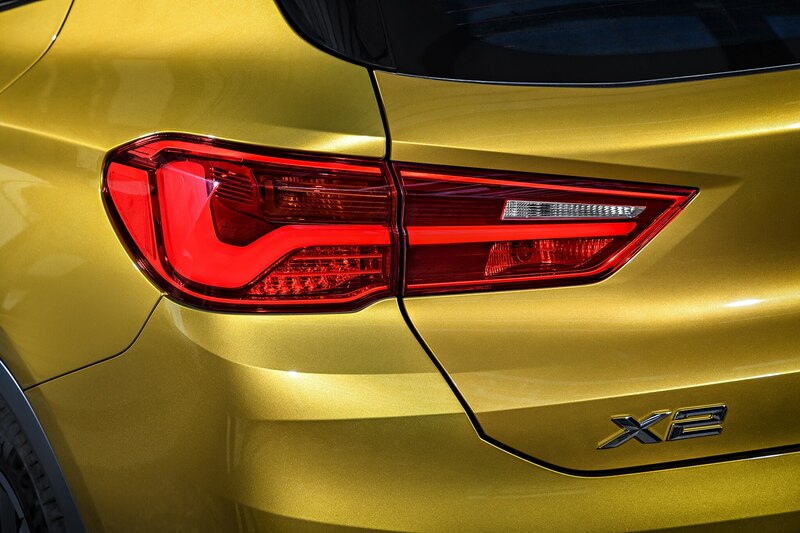 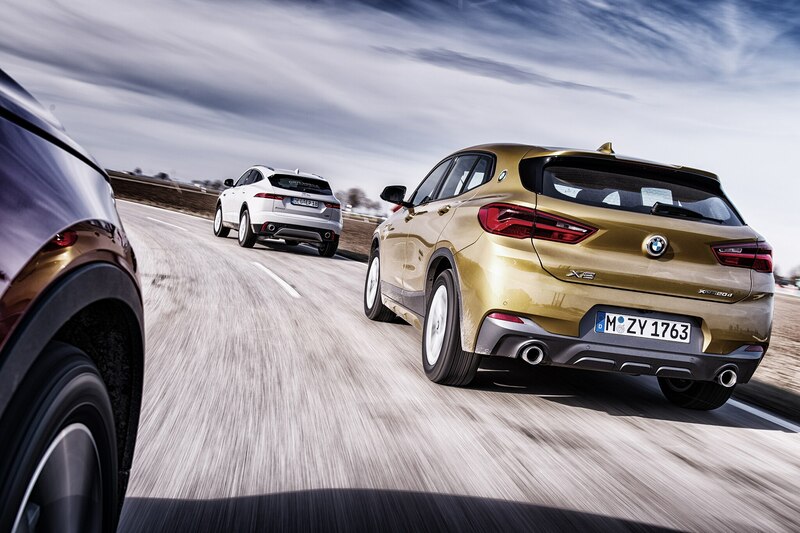 The BMW also snatches away The Golden Index Finger trophy for the most compelling ergonomics. 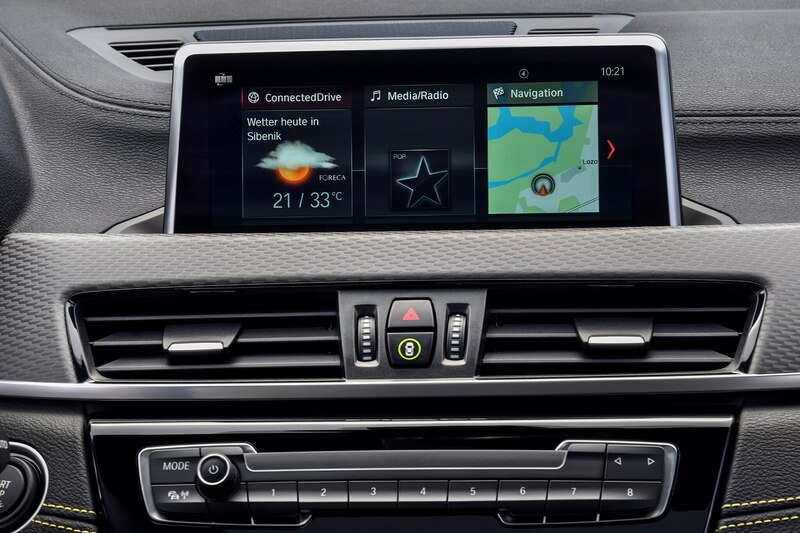 In the midst of touchscreen hype, it retains the iDrive controller which warrants failsafe access to all the chipperies, and it has the fastest and most clever satellite navigation system. 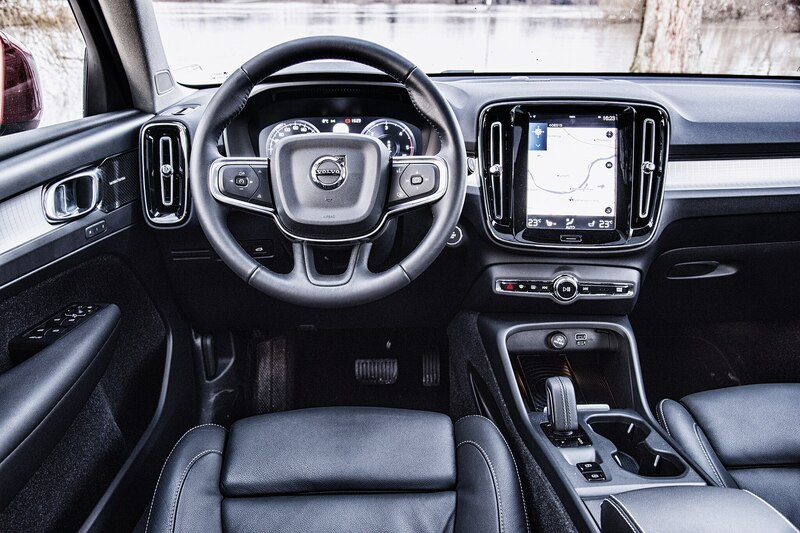 Volvo’s Sensus Connect and Jag’s InControl Touch Pro simply aren’t as accessible and talented as iDrive. 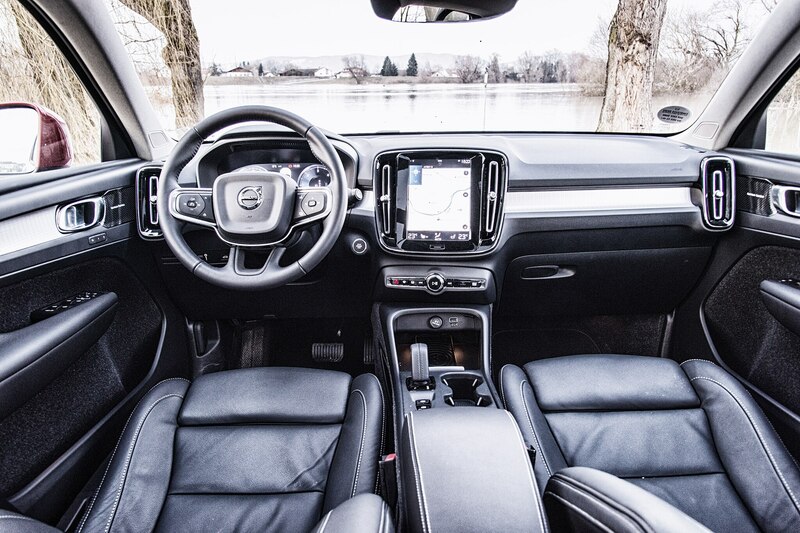 Inspired by the XC90, the XC40 conveys the same contemporary Scandinavian feel-good touch which trades in yesterday’s bright birchwood applications for tasteful man-made surfaces, darker colors, and that tricky trademark tablet. 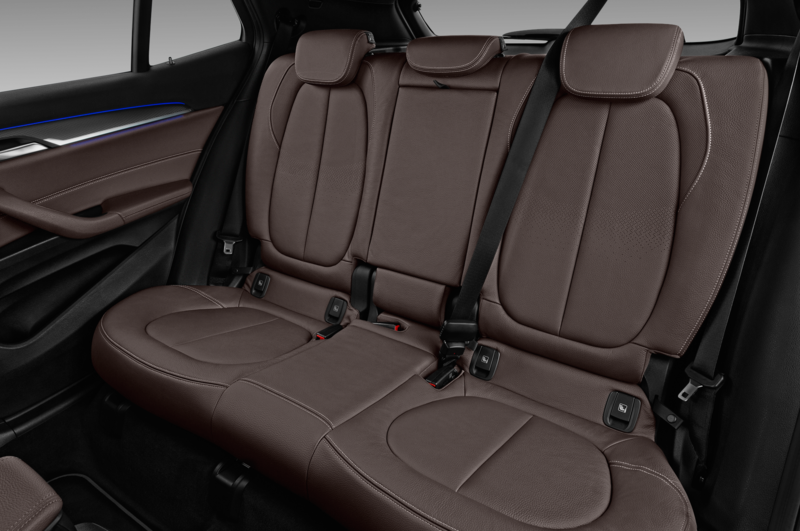 None of these vehicles are proper five-seaters. 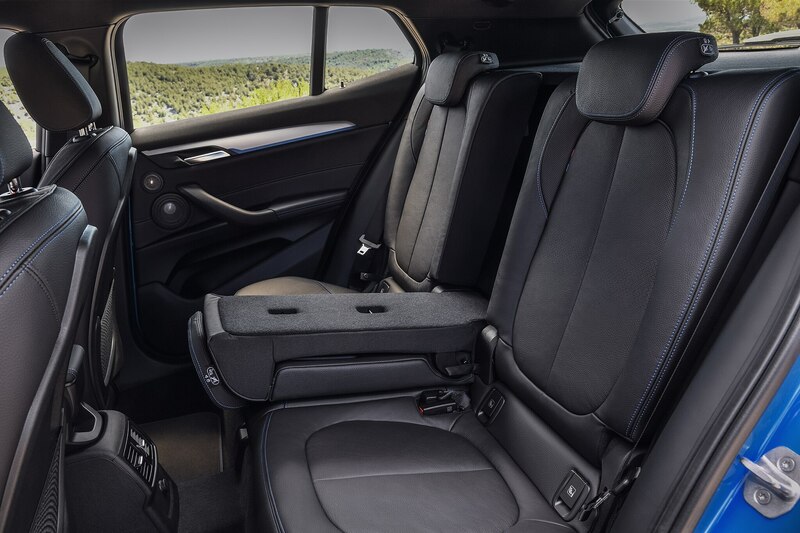 With the front chairs pushed back all the way, rear legroom ranges from marginal to non-existent. 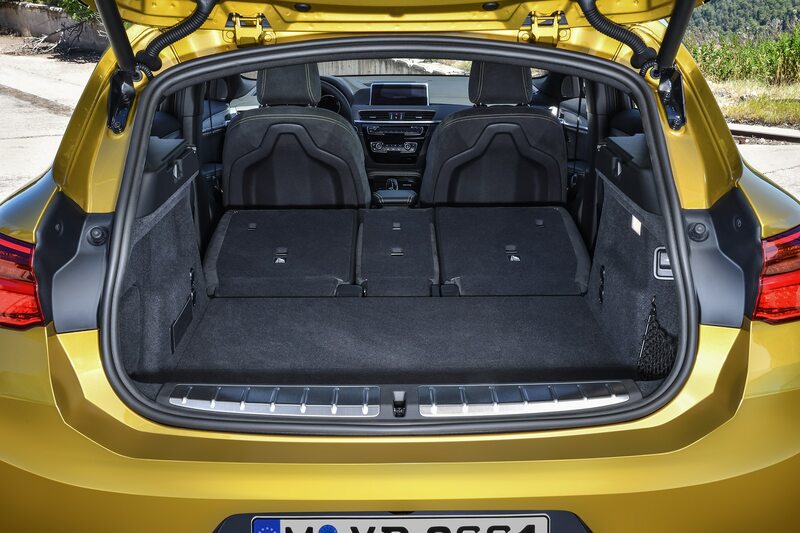 On the credit side, the split benches can fold forward to accommodate the essential utensils of the upwardly mobile. 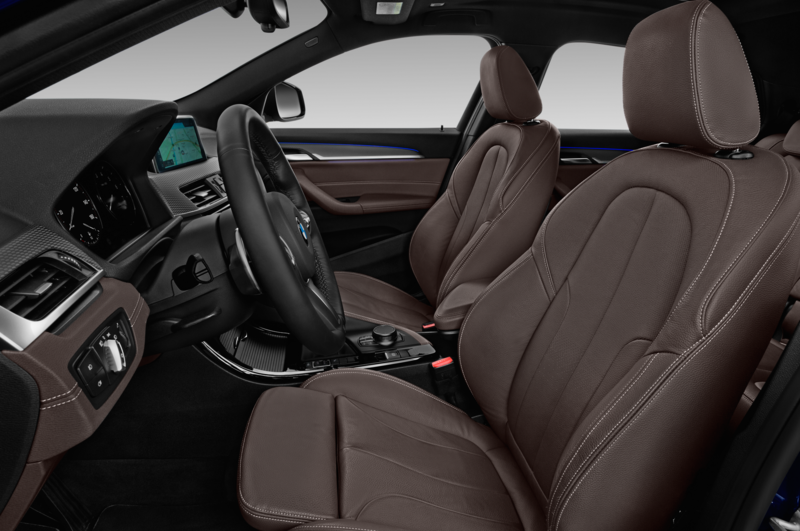 While fake leather already is a no-go, real leather is hopefully also on its way out, especially when it looks and feels as if provided by plastic cows. 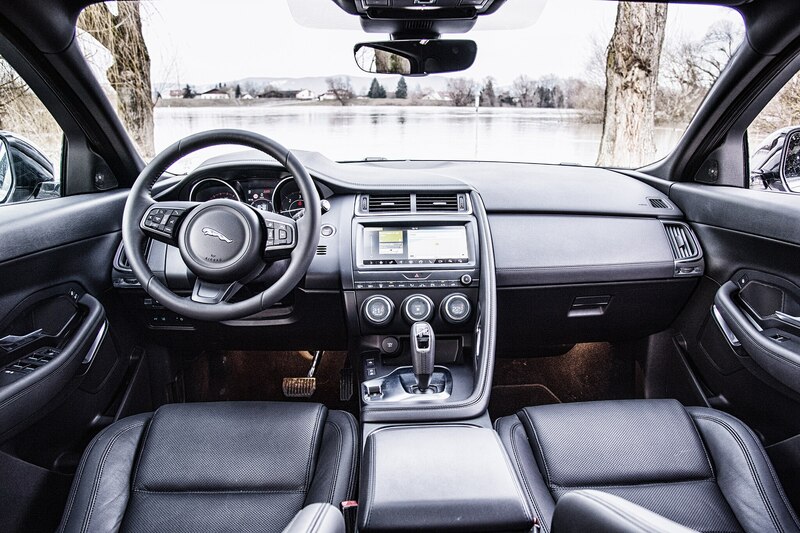 The Jaguar is sufficiently airy and spacious, but it cannot quite match the classy surfaces installed by BMW. 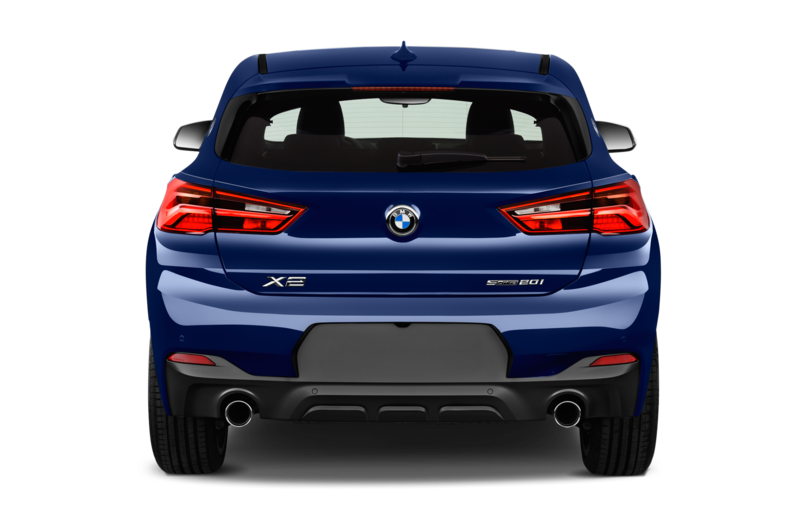 In essence, the X2 is a spiffier and sportier X1 and is our top choice. 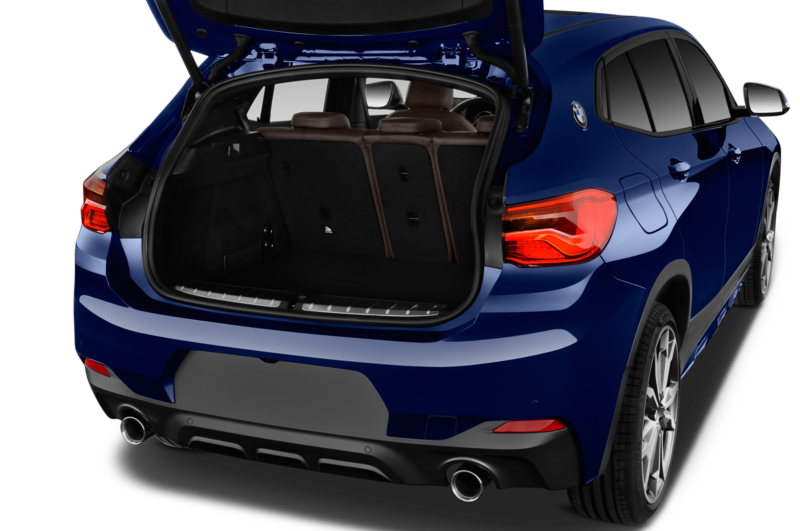 It is expensive (especially when well equipped), its ride is bound to be too firm for some, and the fat C-pillars impair rear-quarter vision. 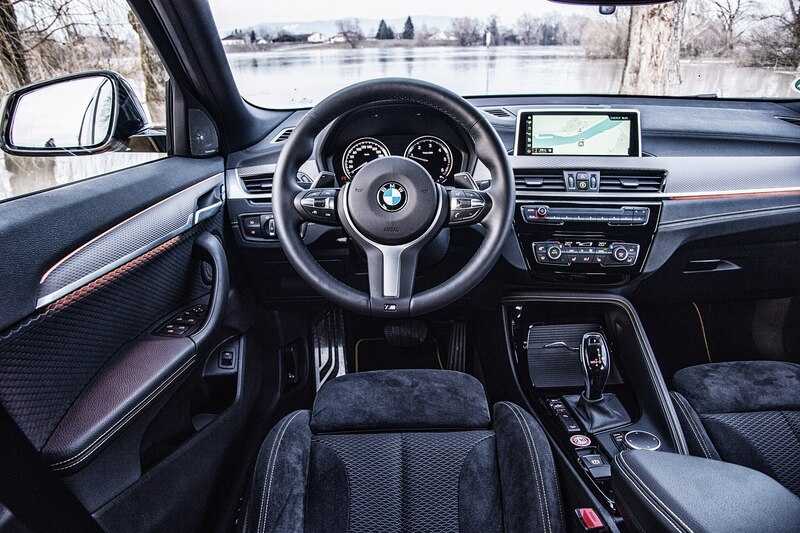 But it is more fun to drive than the rest, quicker and faster, digitally up-to-date, and really well made. 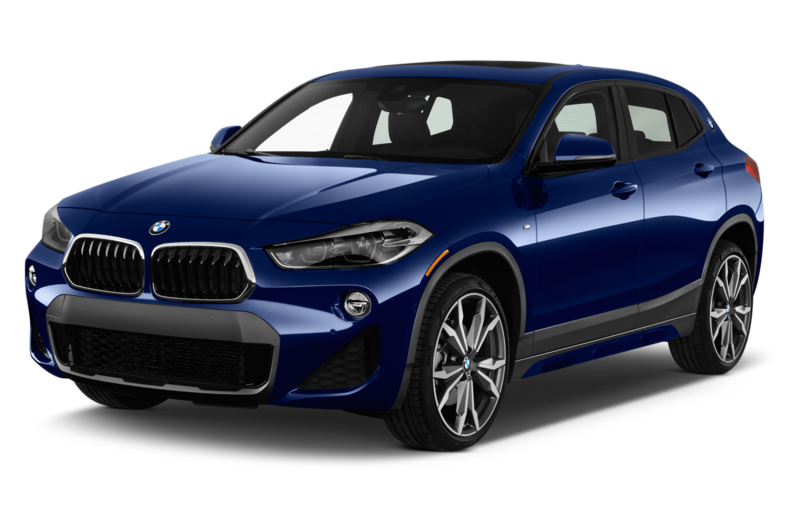 This does not mean the XC40 and E-Pace are bad choices. 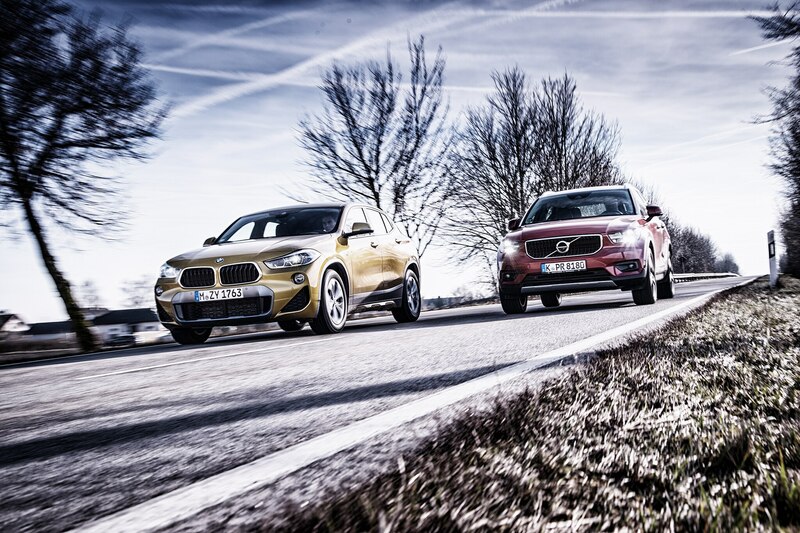 Quite the contrary: in isolation, these two compelling contenders impress with abundant character, flair, and ability.